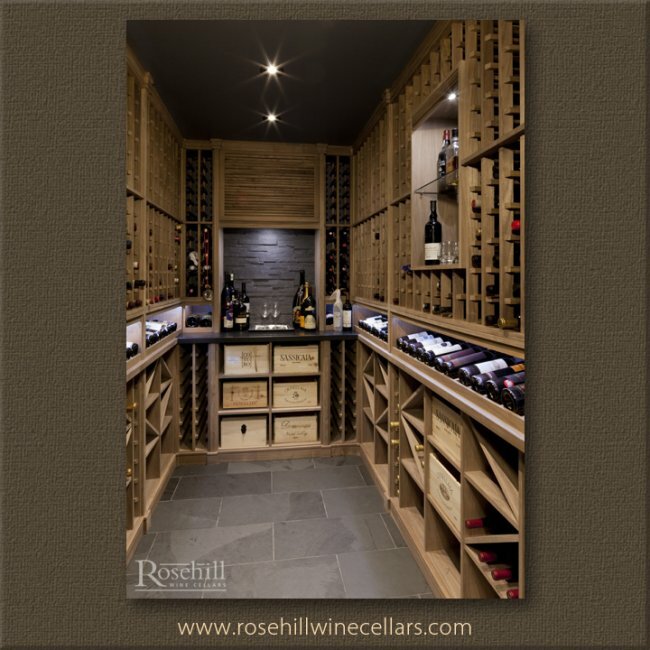 Please explore these custom wine cellars designed and built by Rosehill Wine Cellars, Toronto. 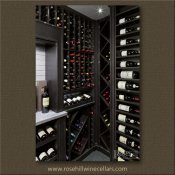 Each cellar is unique to specifications of our customer using traditional wooden racks. 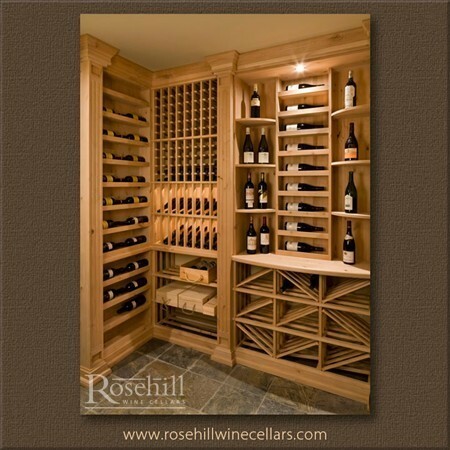 Our custom cabinet shop in Mississauga builds these wine racks and millwork. These cellars would all be in the Greater Toronto area but range as far west as Oakville, Burlington and Niagara wine country. We can also service the Southern Ontario areas ranging from Muskoka cottage country to the Ottawa Valley. 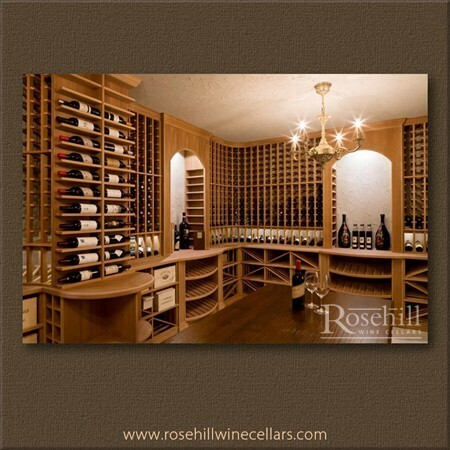 We specialize in more traditional wood cellars but a modern updated twist. Proudly a Canadian company, we are located in the west end of Toronto, Canada. 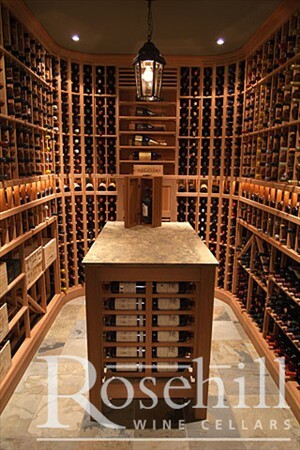 Extraordinary wine cellar built with walnut wine racks with a beeswax finish. The bottle capacity is 1100 wine bottles, and the cooling system is a WhisperKool SS4000. 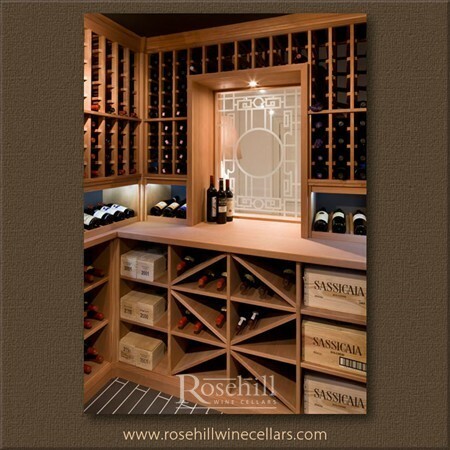 The storage in this custom wine is made up of a combination of individual bottle wine racks, presentation racking, and label facing display racking. View into wine cellar from the billiards room. Entertain in style, right in your very own home. 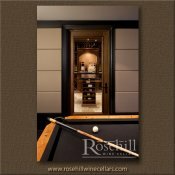 What a treat to have a direct view of your wine collection while playing pool. 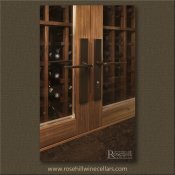 Walnut wine racks with hand rubbed beeswax finish.The custom wine cellar features both a tasting niche and tasting island perfectly centered to display through the exterior grade glass entrance door. 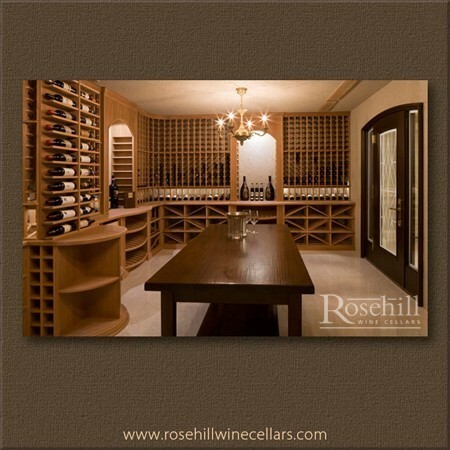 This custom wine cellar features a tasting island and walnut wine racks with a beeswax finish. Notice the feature island designed for wine tasting? This is also a practical feature when bringing home new trophies, or organizing cases of wine. 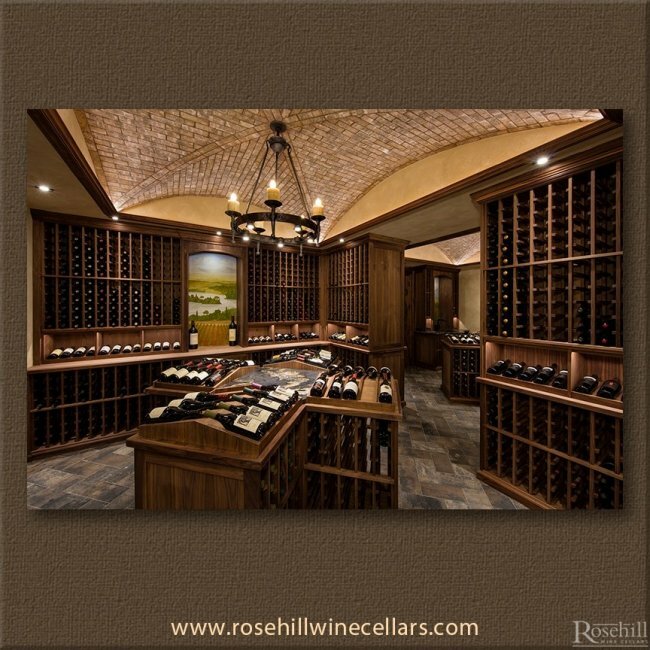 Wide angle view of walnut wine cellar with a tasting island and a tasting niche, holds 1100 wine bottles. 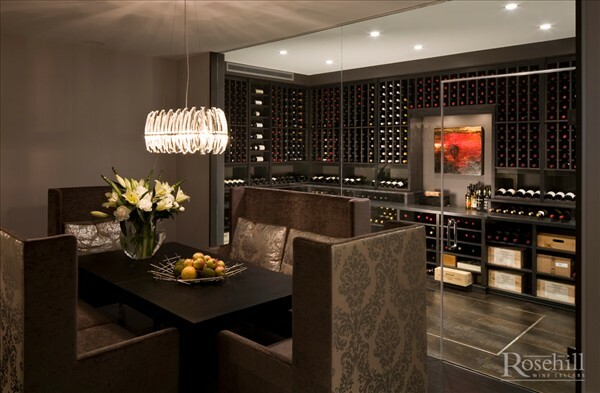 This wonderful wine room features a WhisperKool SS4000 cooling system. 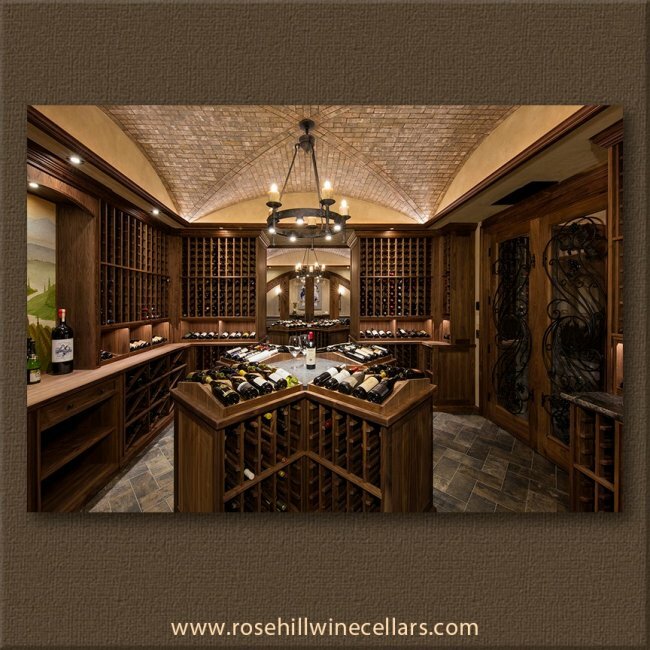 Within this custom wine cellar the racks used are solid diamond bins, individual single bottle storage, case bins, and a variety of display racks. This gorgeous Champagne cellar is constructed out of sapele wood. The cellar is designed with moving wine racks in order to accommodate the small space. The cellar holds 1562 bottles, and is cooled by a Wine Guardian 1/4 ton ducted air handler. 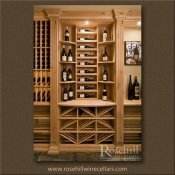 A unique Champagne wine cellar designed with movable sapele wood wine racks to accommodate a large collection in a small space. 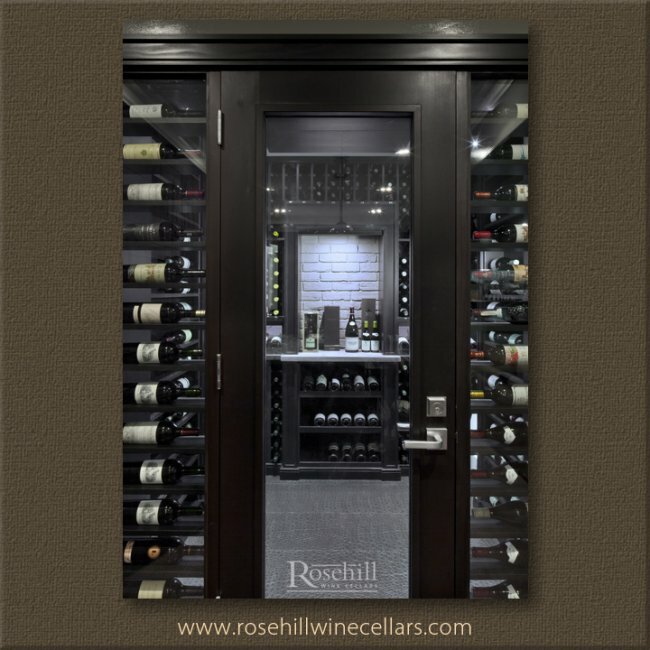 This wine room is built to hold 1562 wine bottles, and is chilled with a Wine Guardian ¼ ton ducted air handler. 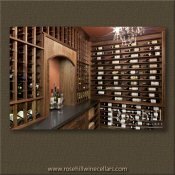 Elegant walnut wine cellar with a beeswax finish and black slate tile flooring. 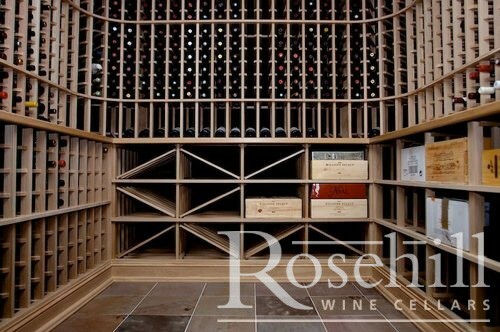 Cooled with a WhisperKOOL split 4000, this wine cellar can store up to 821 wine bottles. This close up view of wine racks with label forward design illustrates how your rarest bottles can be showcased in a beautiful way. 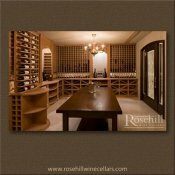 Walnut wine room with a beeswax finish holds a surprising 821 wine bottles. Features black slate flooring and a WhisperKOOL split 4000 cooling system hidden behind a custom wood grill. 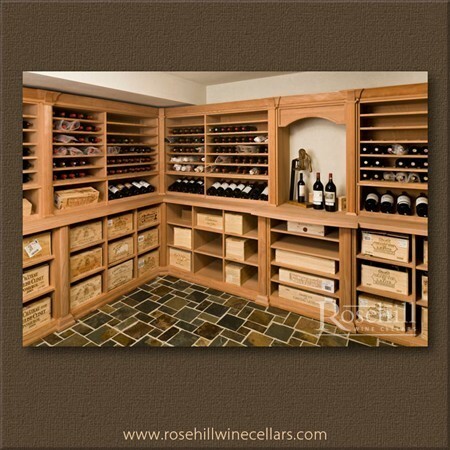 Beautiful wine cellar with walnut wine racks, a beeswax finish and black slate tile flooring. Holds up to 821 wine bottles and is cooled with a WhisperKOOL split 4000. Features stunning arched tasting niche. 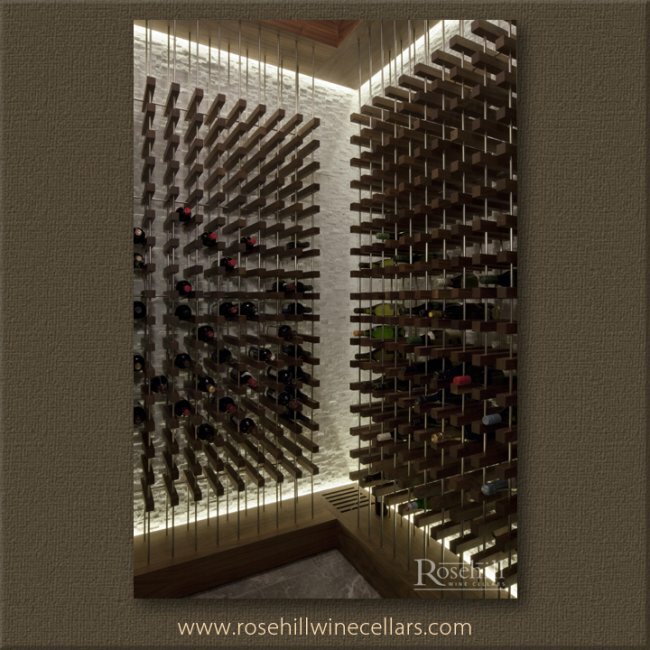 A highlight of this custom wine cellar Is a feature wall constructed with a label forward display design. 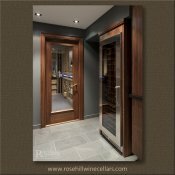 Doorway view of walnut wine cellar with black slate tile flooring and a beeswax finish. Can store up to 821 wine bottles and is cooled with a WhisperKOOL split 4000. Custom door with glass panel and rustic black metal hardware. Magnificent wine room stores up to 821 wine bottles. 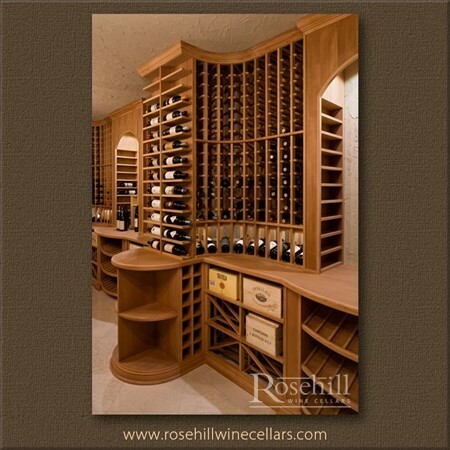 Features walnut wine racks, black slate flooring, presentation racks, an arched tasting niche. This cellar is cooled with a wall mounted 4000 btu WhisperKOOL split system. Close up detail view of turning mechanism for moving storage style wine racks within a large champagne cellar. Similar to the olden style moving bank vault. Maximize your wine collection in minimal space. 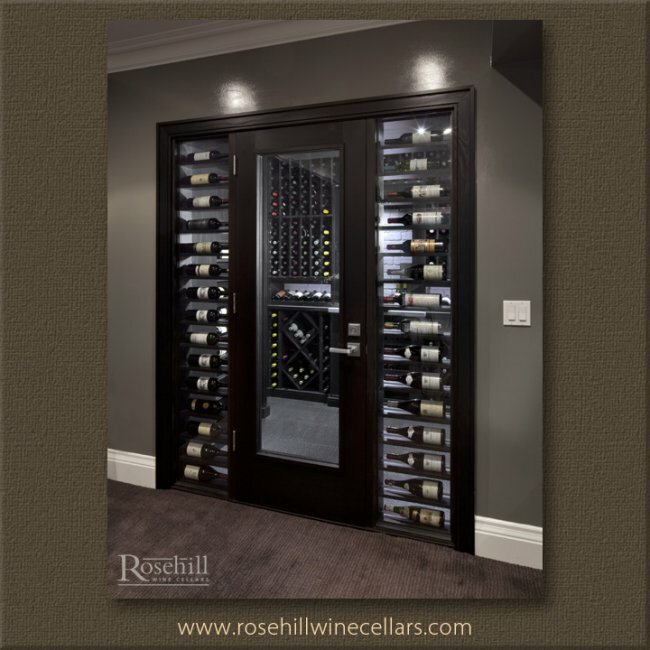 Cooled with a Wine Guardian ¼ ton ducted air handler, this practical wine cellar holds up to 1562 wine bottles. Close up view of unique Champagne storage bins within a dedicated Champagne wine cellar. 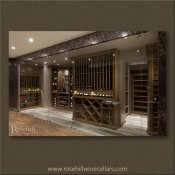 This cellar was built with custom sapele wine racks. Expertly designed, this wine room holds up to 1562 Champagne bottles in a very small space. Refrigeration system is a Wine Guardian ¼ ton ducted air handler. Wine Cellar with walnut counter tops and beeswax finish. 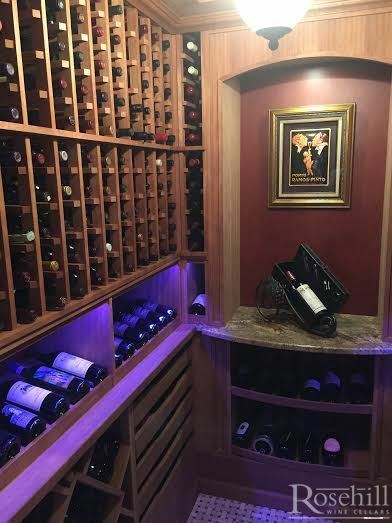 This beautiful classic wine cellar has modern touches like LED lighting and a custom walnut door with a thermal pane glass insert. The wine cellar cooling unit is an ONAM water cooled unit. An oversize center island is featured with diamond bins and case bin storage. Wine Cellar with walnut and Beeswax finish. Wine room with walnut counter tops. 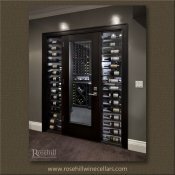 This beautiful, classic wine cellar has LED lights, a walnut door with a Beeswax finish and a thermal pane glass insert. The wine cellar cooling unit is an ONAM water cooled unit. Directly behind the center island is a unique tasting niche that was an ideal location to display this collectors favorite large format bottles. The label forward display area can accommodate 3L to 6L bottles. Beautiful wine cellar with walnut counter tops and extensive wine storage. This classic wine cellar features LED lights and an ONAM water cooled cooling unit. Notice the custom wood louvers designed to camouflage ducts for the cooling system. Wine room with walnut counter tops and a beeswax finish. 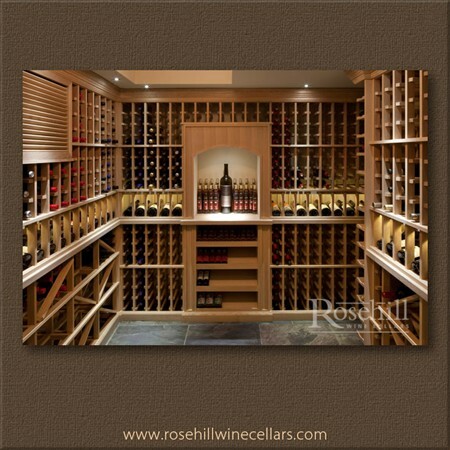 This beautiful wine cellar has LED lights and a stunning round corner shelf for trophy wine display. The wine cellar cooling unit is an ONAM water cooled unit. 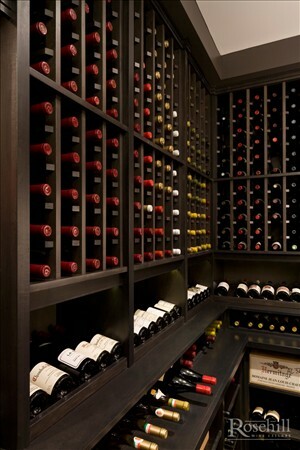 The warm burgundy walls accent the richness of the wooden wine racks. Close up of walnut wine racks. 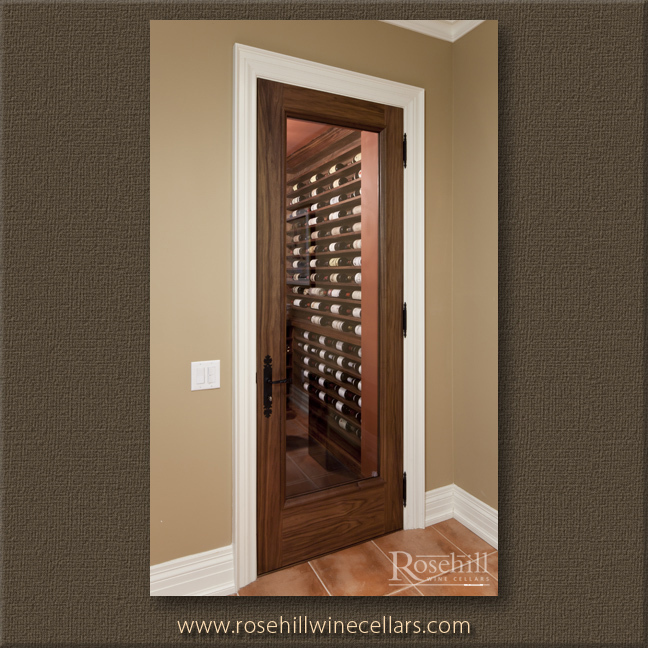 Wine cellar features extensive wine storage, LED lighting, and a walnut door with a thermal pane glass insert. The wine cellar cooling unit is an ONAM water cooled unit. Unique use of sideways display racking system in area with a lower ceiling, maximizes storage space within the cellar, and takes advantage of all areas. 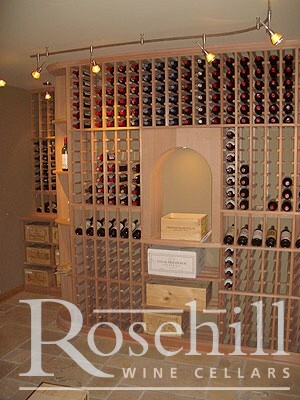 (SL) This stunning custom wine cellar is finished in walnut with a bee’s wax finish. A long tasting table serves as a centre piece to share a glass of wine within this climate controlled cellar. A thermostat control and wall sconce are located on a beautiful stone clad wall. In addition to a custom herringbone sliced ceiling, this custom racking display features single bottle storage in the upper racks, wood case box storage, and custom diamond bins throughout. The upper and lower storage areas are separated by double tier of presentation racks. The bees wax finished walnut provides a warm glow and texture to the wooden racks. 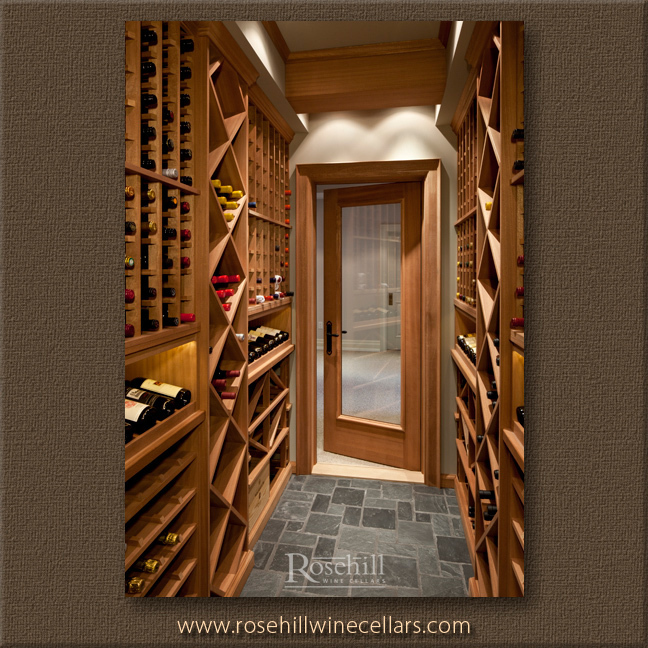 (SL) The view into a custom wine cellar starts with the door. After all, you can only make a first impression once! This custom walnut door is finished in bee’s wax, incorporating another level of richness in the finished wood. Enhance your wine experience with all senses being stimulated. Relax and enjoy a glass of wine in your contemporary entertainment room. 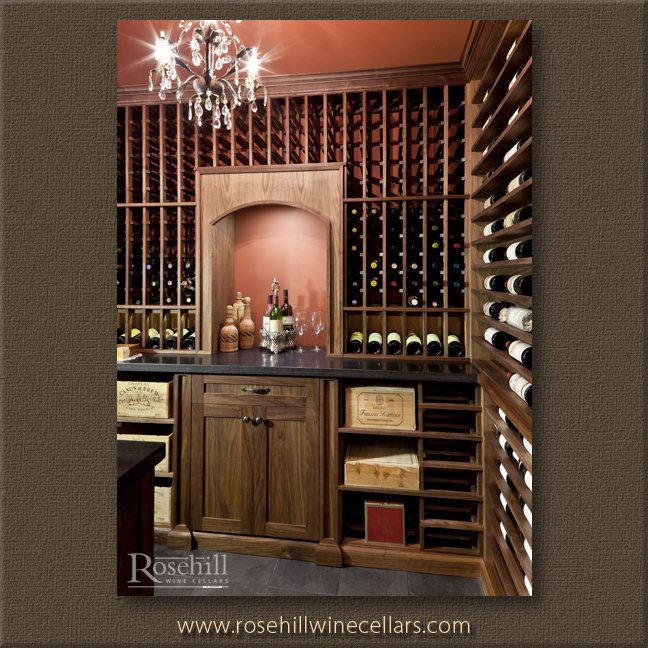 Cozy up to the custom bar, and enjoy a fine glass of wine while looking into your very own custom wine cellar. Glass door and side lights enhance the view into this custom wine cellar, while ensuring appropriate insulation for proper climate control. 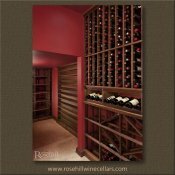 Designed by Gary LaRose this contemporary redwood wine cellar, stained and top coated, features diamond bins and label forward racking presentation for wine storage. Cooled with a WhisperKool Mini Split wine cooling system installed above the door. This beautiful, yet modern, redwood wine cellar is stained and top coated to extend the tasting room into the cellar. It features granite counters and contemporary leather floors. 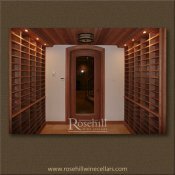 This wine room is built with a tasting niche framed perfectly by the label forward wine racking peeking through the sidelights. 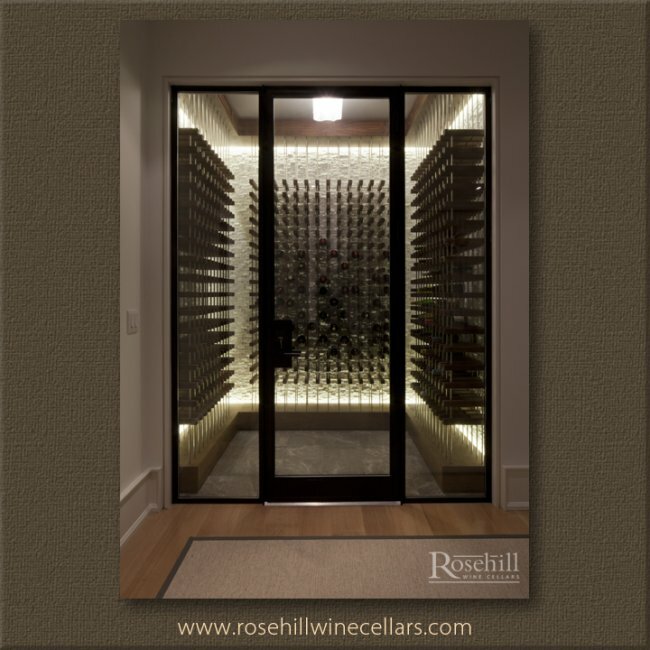 A large door with exterior glass help enhance the view into this wine cellar. 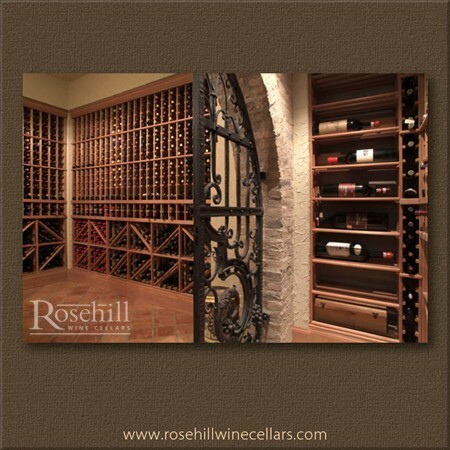 Wine is kept at perfect cellar temperatures with a WhisperKool Mini Split cooling system. Door way view into contemporary wine cellar with side lights. 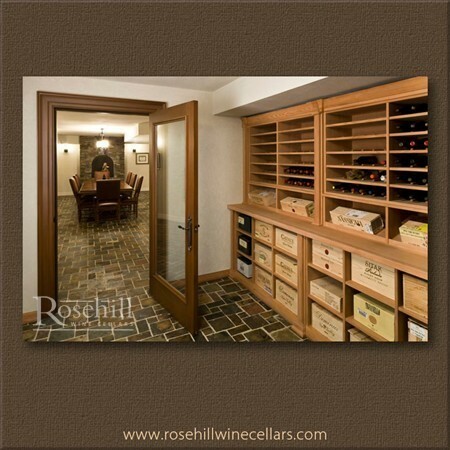 Label view of wine bottles on either side of entrance welcomes you to this custom wine cellar. Exterior grade door with custom hardware. 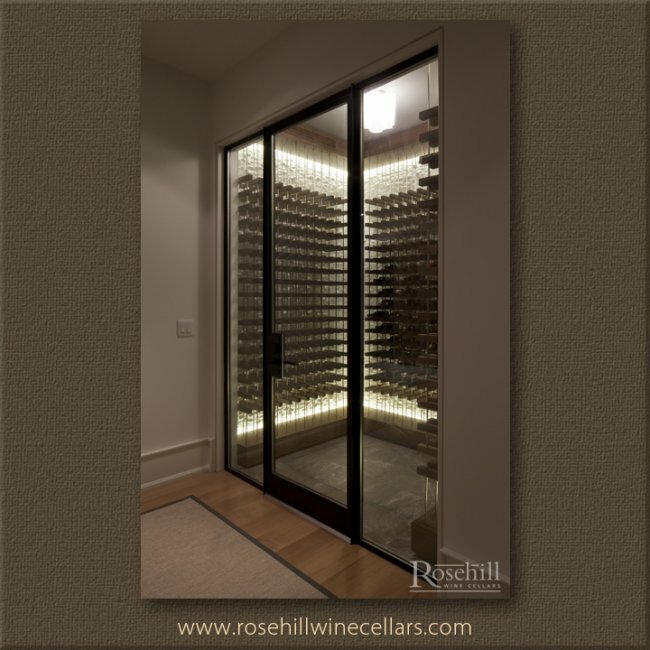 Outside view of a sleek and contemporary wine cellar with dark stained redwood wine racks. 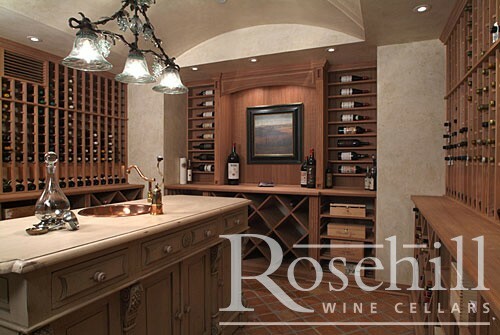 Granite counters and leather floors extend the luxurious feel of this custom wine room. 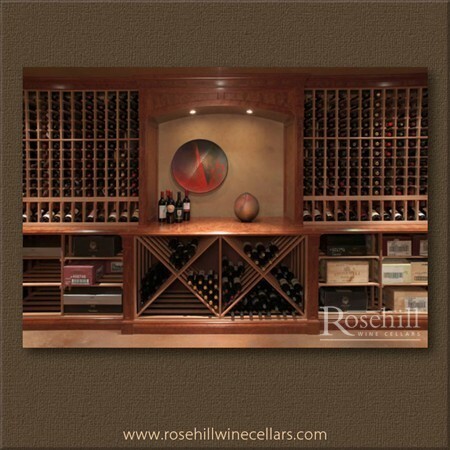 Impress your family and friends with an arched tasting niche where you can display your wine or wine related art work. This spacious wine room has a full glass wall, and features extensive walnut wine racking systems in varying configurations. 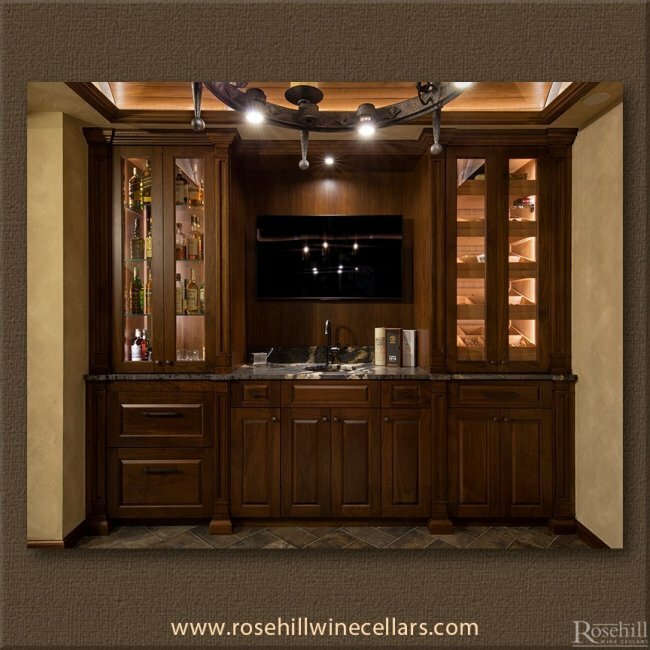 This elegant walnut wine cellar has an arched tasting niche and a ducted cooling system. 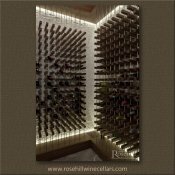 The ceiling is studded with LED lights that illuminate this extensive and stunning wine storage cellar. 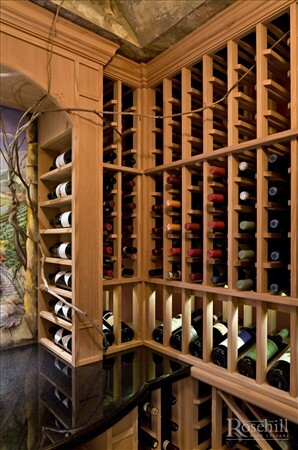 This wine room also features a wide array of wine racking displays. 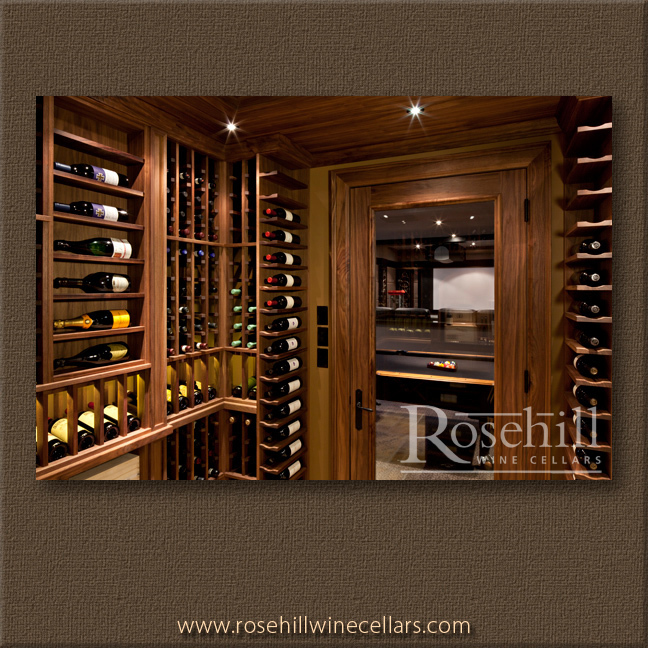 This extensive walnut wine cellar features full glass doors, a ducted cooling system, and LED lighting. In this photo you can see how custom racks can make the best possible use of odd spaces. 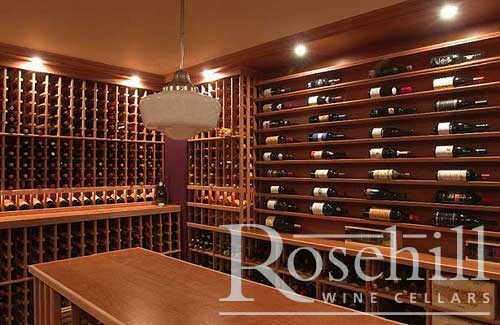 Besides this low space under the stairs that is used for a unique presentation area, this wine room also has a dedicated area for Champagne, as well as walls and walls of individual wine bottle racking. 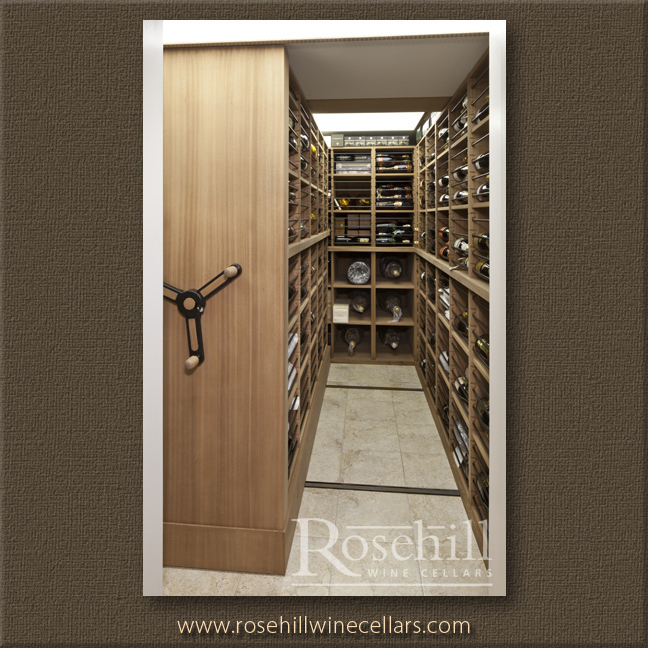 With full, edge-to-edge glass walls and doors, this walnut wine cellar is designed to amaze! 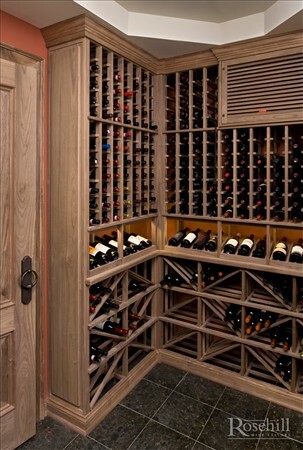 Beautifully built, this wine room can store any extensive wine collection for the most prolific collector. 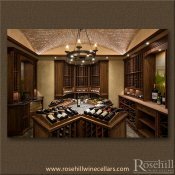 This full glass wine cellar features overhead LED lighting, a dedicated area for Champagne storage, and an arched tasting niche. 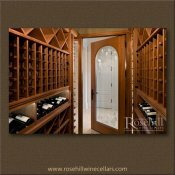 A custom doorway view of stunning wine cellar that holds up to 1280 wine bottles. 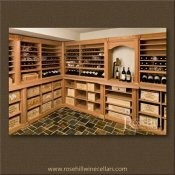 This wine cellar is constructed using sapele wine racks, slate flooring, and a walnut door with a beeswax finish. Outside of the wine cellar is an elegant wine room featuring a Cavavin built in Majestika wine fridge for additional wine storage. This beautiful wine room holds 1280 wine bottles and features a wide variety of sapele wood wine racks, as well as a tasting niche on the back wall. The floor is made of classic slate and the cooling unit is a WhisperKool 4000 split cooling system with the evaporator behind the grill. Notice, this collector has a couple wood cases of one of our favorites: Sassicaia! Close up view of sapele wine racks and showcase shelving. Showcase shelving is a great way to show off any prized art work or your favourite wine bottles. 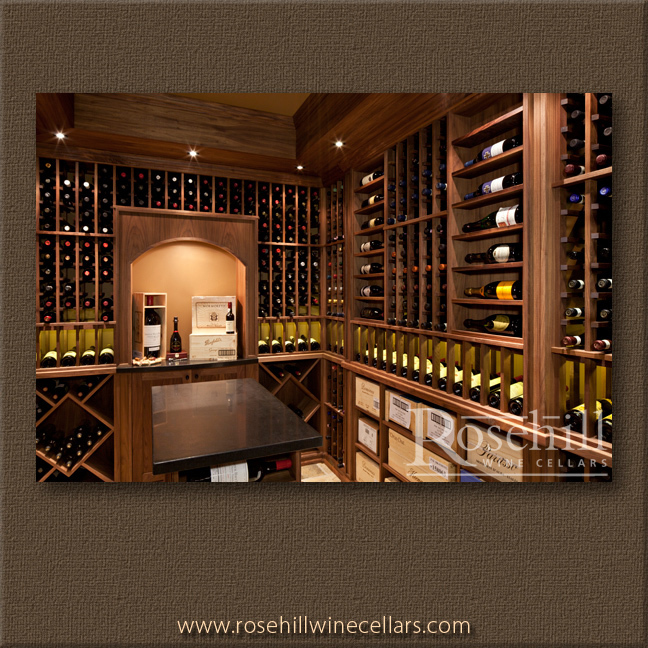 This wine room also features presentation shelving designed to display your best bottles and impress your guests. This tasting room is just outside of a large sapele wood wine cellar. 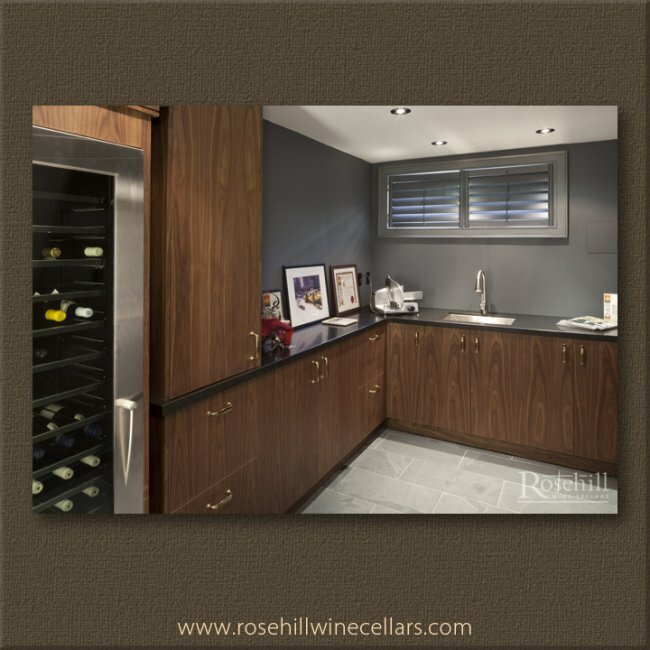 The tasting room featuring a wine fridge for additional wine storage, and custom made Rosehill walnut and beeswax cabinetry. 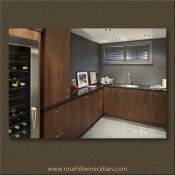 Space for a wet sink, prosciutto slicer and solid door wine glass storage cabinets was a must have for this wine enthusiast. 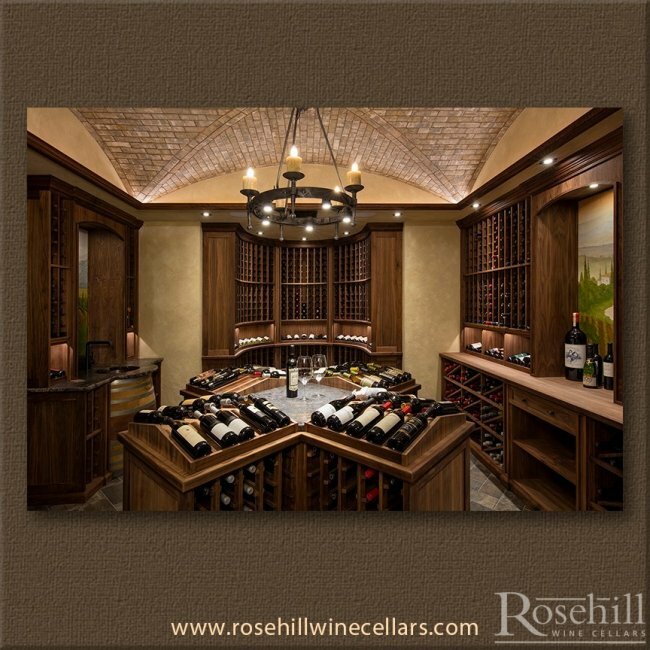 This classic wine cellar is built with custom walnut cabinets and is situated in an elongated room that functions as an important passageway in this collectors home. Underneath the cabinets are drawers that are cooled from below. The doors have a topcoat and the wine racks are finished with beeswax. The counters are granite with antique leather. 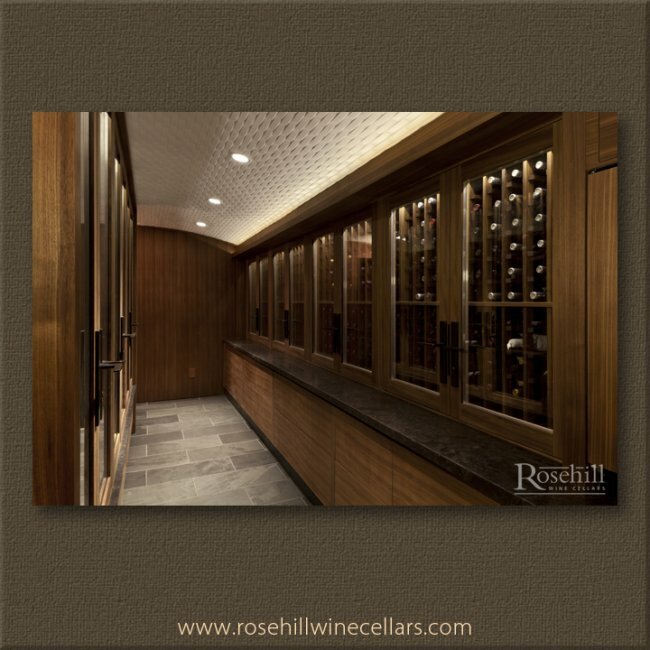 Only the custom cabinets within this cellar are climate controlled, not the entire room. 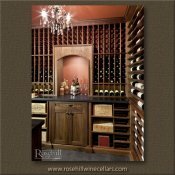 This sophisticated wine cellar is built with drawers that open underneath the wine display cabinets. The double drawers are cooled from below with a Cellar Pro ducted 3000s cooling unit. These beautiful counters are dark granite with antique leather. Multiple ducts cool the length of cabinetry on both side of the room while the room itself is not climate controlled as a wine cellar. 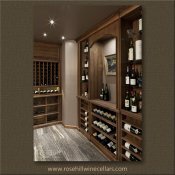 This unique wine storage cellar is built with walnut cabinets and drawers that are cooled from below. The cellar is cooled by two separate Cellar Pro ducted 3000s cooling units. 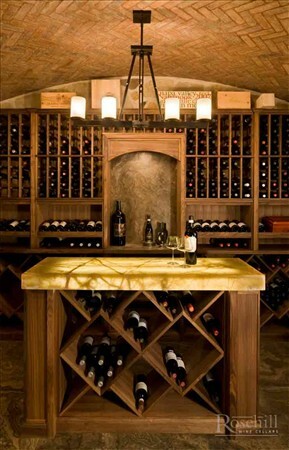 Impress your guests with beeswax finished wine racks and granite counter tops with antique leather. Close up view of wine storage cabinet features classic wine racking finished with a hand rubbed beeswax. The granite counters feature antique leather, and dark metal hardware to further accent the granite and cabinet finish. 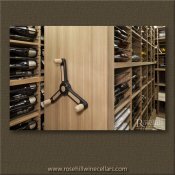 This contemporary wine cellar is made with walnut cleats and stainless steel spacers. It features a walnut base and bulkhead with a thermal pane glass wall and door. The cooling system is a Cellar Pro Air Handler ducted system. Close up view of a unique wine racking system created with walnut cleats and stainless steel spacers. This cellar shows how creative a collector can get with their wine storage. Contemporary wine systems like this can make your wine look like it is floating! A close up angle view of specialty custom wine rack made with walnut bottle cleats and modern stainless steel spacers. 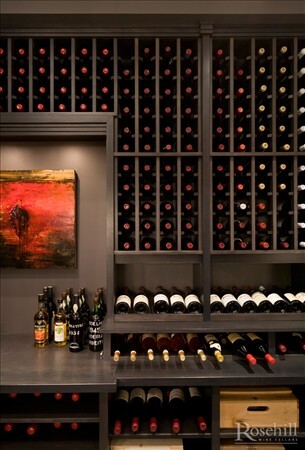 This system is a great example of how beautiful a contemporary wine room can be when mixing lightly colored stone, dark rich wood, and cool modern stainless steel. Close up view of a properly sealed thermal pane glass door. 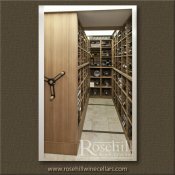 This elegant and modern wine room is made with walnut cleats and stainless steel spacers to hold the wine bottles in a beautiful new take on traditional wood racking. Keep your wine safe by installing a secure door with a lock on your wine storage cellar. (SL) This narrow wine cellar features presentation racks with blue lighting for a unique effect. 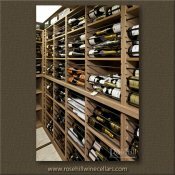 Sliding drawers allows alternative storage for a few of those very special vintages. 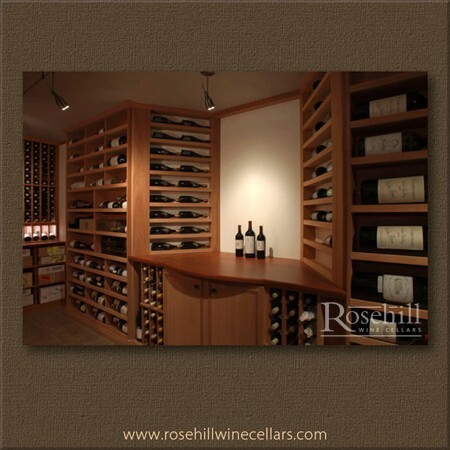 By curving the display countertop, maximum surface area is extracted within this small custom cellar. 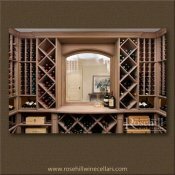 Niche display area with arch treatments allows for a defined focal point in the wine room. 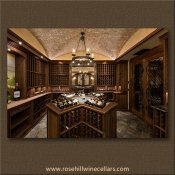 Beautiful custom wine cellar featuring all heart redwood racking designed with an elegant barrel ceiling and stone walls. This wine cellar is situated at Golden Lake in Ontario. 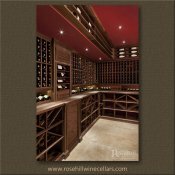 Elegant custom built wine room on Golden Lake, Ontario features redwood wine racking and stone walls with an arched ceiling. 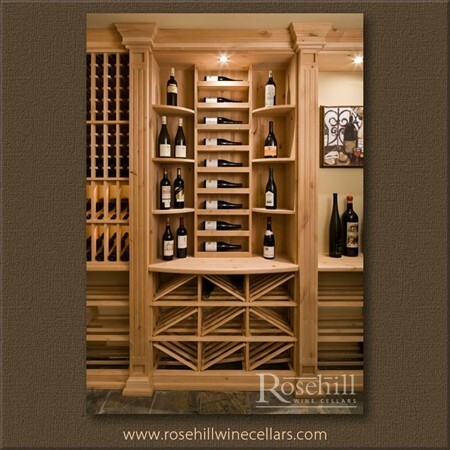 Little details in the custom mill work really takes this wine racking to a whole other level. 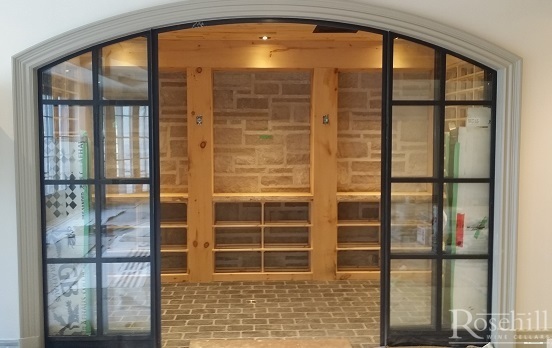 Custom wine cellar built for a cottage on Golden Lake, Ontario; this cellar is designed with beautiful all heart California redwood wine racking. Note the stone walls and ceiling that contrast the wine racking so well. 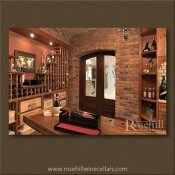 Entry view of elegant rustic wine room built with reclaimed beams from first growth timber. 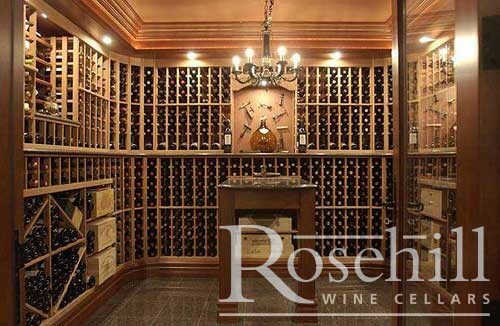 This stunning wine storage cellar is a little different from other Rosehill wine cellars and is built with a country flair. 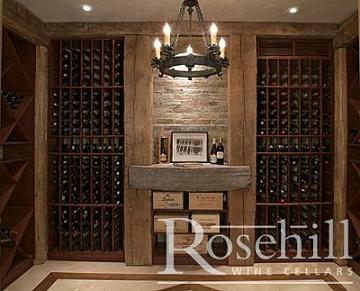 Picturesque wine room featuring reclaimed beams. All posts and beams in this gorgeous wine cellar are built from first growth timber. This wine cellar stores an extensive wine collection and features unique diamond bins, wood case bins, display areas, and tile flooring. Notice the ceiling mount split system by WhisperKool buried in the ceiling out of normal sight lines. This is a unique wine cellar built with a more rustic vibe. All posts and beams within this wine cellar are built using reclaimed beams from first growth timber. 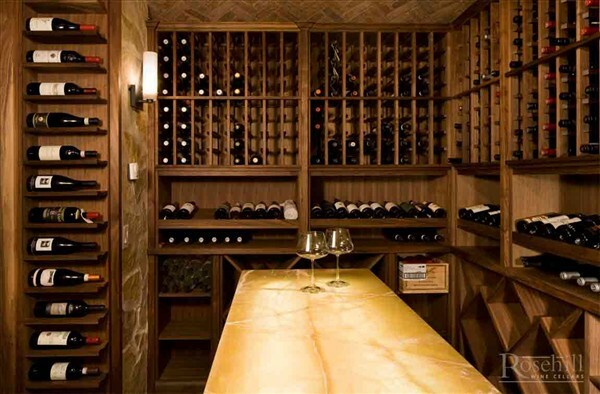 This wine room also features tile flooring, wood ceiling and overhead lighting. 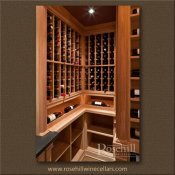 (SL) Why leave your custom wine cellar if you don’t really need to? Clean your wine glasses in a corner sink or use it as a serving area while hosting a wine tasting. A sink, while rare, is a luxury feature within the wine cellar itself and allows for quick and easy clean up your decanters, glassware and other wine accessories. The sink also acts as a stand alone spittoon with no clean up required. 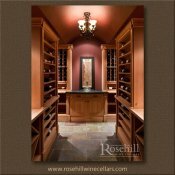 The walls of this wine cellar are finished with stone to give a rustic look and is complemented by a marble top island. 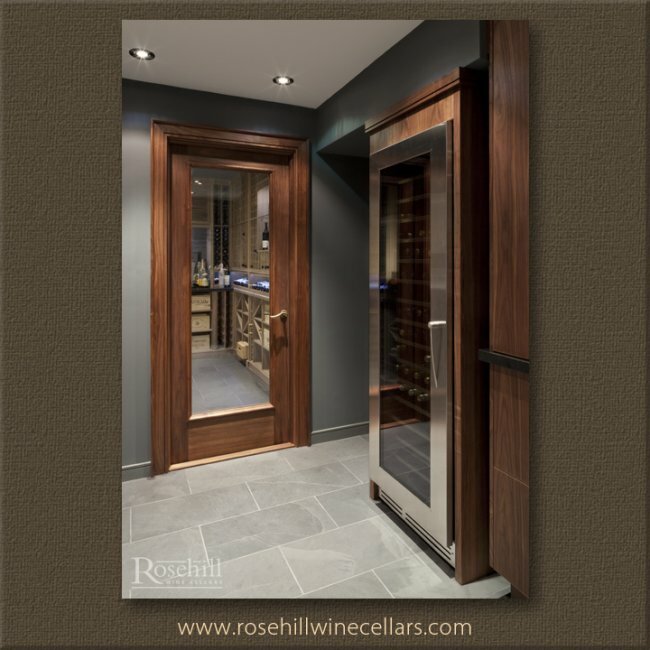 One of our horizontal bottle displays to the left of the door showcases wine labels that are also visible when viewed through the glass door. 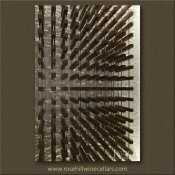 The wine rack display is featured in walnut with that has been hand rubbed with a bee’s wax finish. 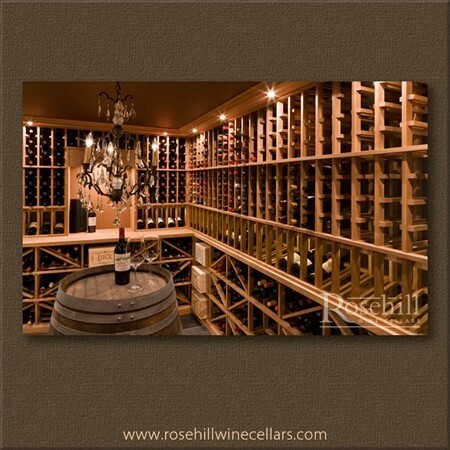 (SL) Every custom wine cellar deserves a stunning centre piece. This cellar features an island with one of a kind marble counter top; when illuminated the marble shows the grain and natural detailing of the stone. Truly a spectacular piece. 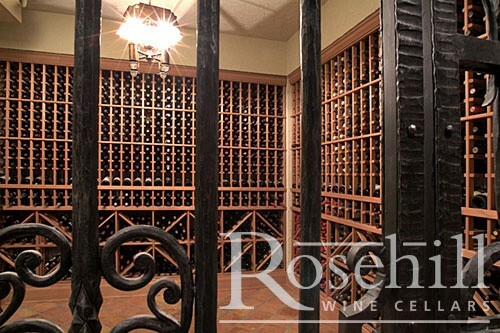 This custom wine cellar is surrounded with details to make any wine enthusiast raise a glass for a toast. We feature a curved herringbone sliced stone ceiling. 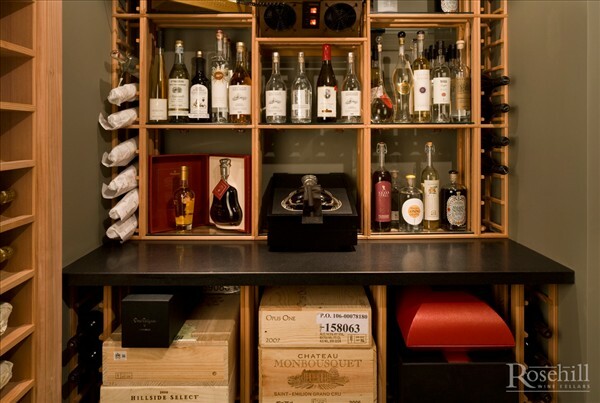 Individual bottle wine racks make up the larger portion of the upper storage area. The wine display is nicely balanced with stunning presentation of trophy wines above custom diamond bins throughout the low level of racking. (SL) The stunning walnut custom cellar features in the lower storage area, beautiful sliding display drawers. 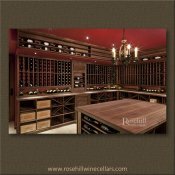 Multiple banks of 6 high pull out sliding drawers, are designed to perfectly display this wine cellar collection in two separate areas. One with a custom wine tasting niche and lower custom cabinetry. While the other upper section adds additional presentation display storage and individual single bottle display storage. 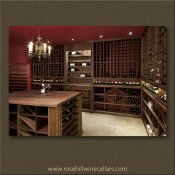 Beautiful wine cellar with walnut drawers and custom wine tasting niche, designed to perfectly display this wine bottle collection. 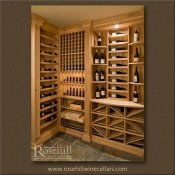 Beautiful wine cellar with pull out walnut drawers and custom racking elements. This image shows that even a narrow area beside the door can be used for displaying the wine collection. In this cellar, the customer is using this space for champagne and oversized bottles. Lit with LED lighting and featuring a unique racking system made with walnut cleats and stainless steel spacers, this magnificent modern wine room also has a thermal pane glass wall and door. The cooling system is a Cellar Pro Air Handler ducted system. (SL) For convience, presentation and easy storage. 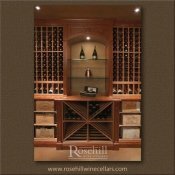 This custom wine cellar design incorporates multiple banks of beautiful walnut sliding drawers in the lower storage area. 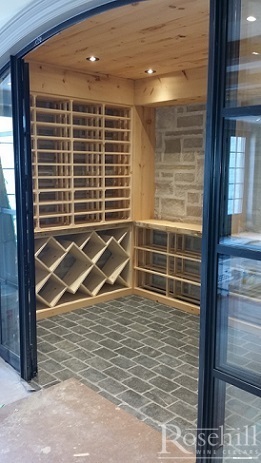 In addition, covered storage of custom cabinetry allows for alternative bottles or glasses to be stored below the tasting niche within the wine cellar. Above the rail, presentation display storage creates a divide, between the upper individual single bottle storage. 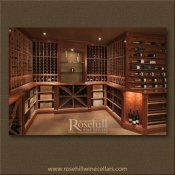 Beautiful wine cellar with walnut drawers and custom wine tasting niche, designed to perfectly display this wine bottle collection. 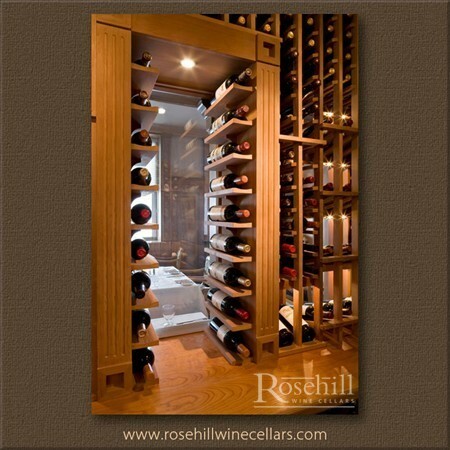 Covered storage allows for alternative bottles or glasses to be stored in wine cellar as well. 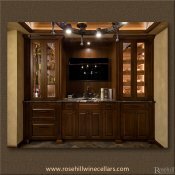 (SL) This beautiful walnut wine cellar features a custom tasting niche with arch and custom cabinetry in the lower storage area. 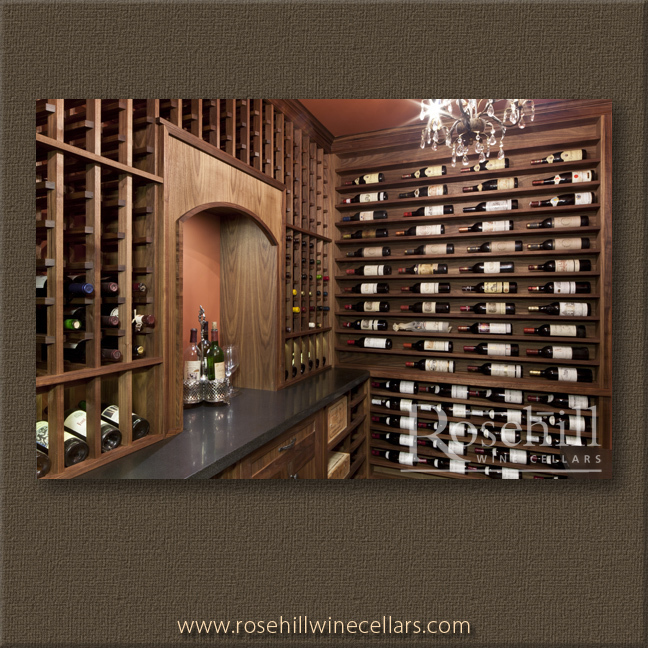 The remainder of the custom walnut wine cellar incorporates sliding walnut display drawers in the lower storage. 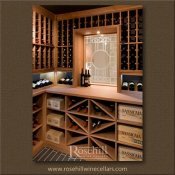 This wine cellar design allows one to display wine bottles in convenient pull out drawer to easily see the wine collection at a glance. While the upper storage is comprised of display presentation racking at the rail and individual single bottle storage above . 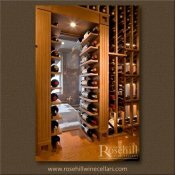 (SL) A stunning glass door is featured in this wine cellar with a granite topped peninsula. 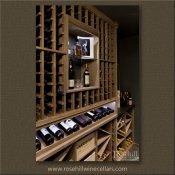 This wine cellar provides a variety of wine storage options within the wooden racking from angled displays and individual wine bottle storage. This wine cellar also features a mix of diamond bin storage, short and wide width wood case boxes showcasing the winery's crest. 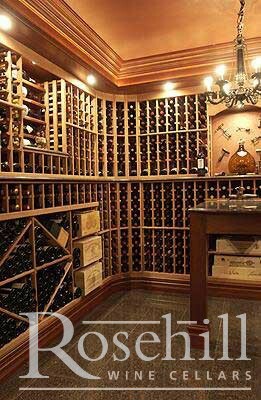 Special wine cellar features include: extra large stacked crown molding and ornate chandelier. 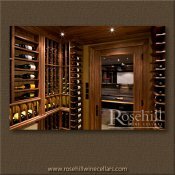 (SL) The custom wine cellar features a dark granite top peninsula which allows for a place to rest wine glasses or boxes. 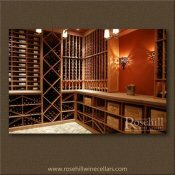 This wine cellar features 12 bottle Bordeaux wood case box storage below the peninsula. The label out view of the wine boxes allows the owner to present a wonderful visual display of some of their prized collection. Above the counter rail, is also a featured five bottle label presentation niche to showcase various wines. (SL) The lower area of the racking design captures both balance and symmetry on both sides of the cellar. In addition to single bottle storage throughout the lower section of the cellar there is a mix of diamond storage bins plus shorter wood case boxes. The details of this wine cellar is also highlighted by the extra large stacked crown moulding and ornate chandelier. 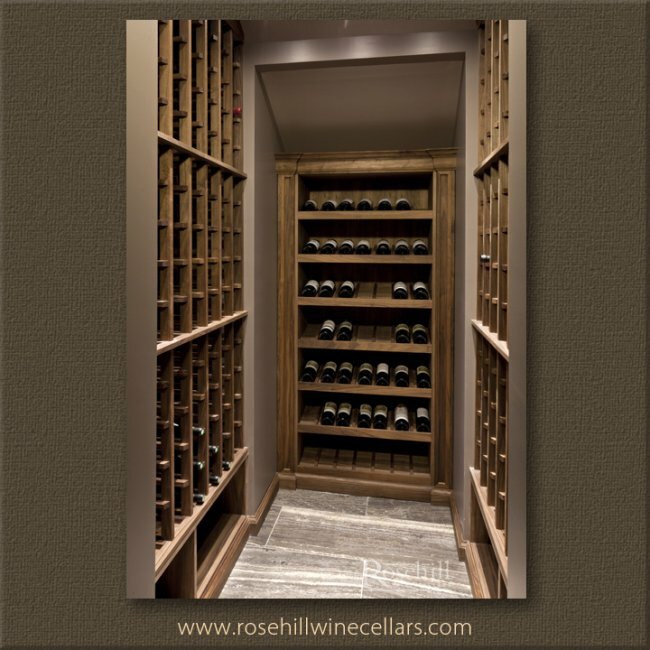 (SL): A variety of storage options is always a benefit within a cellar. The wood case bins showcase the winery crest, but can be awkward to access unless you have a sliding shelf. 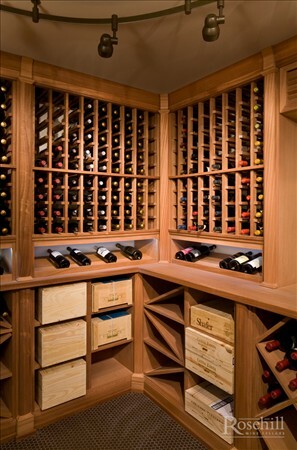 The custom wine racking features a mix of single bottle storage above and diamond bin storage below. (SL) Corkscrews certainly have come a long way to what’s available for wine openers today. These nifty antique openers certainly provide nice visual interest within this classic wine cellar. The arched facia allows for a decorative focal point in the cellar without the expense of a full decorative arch. 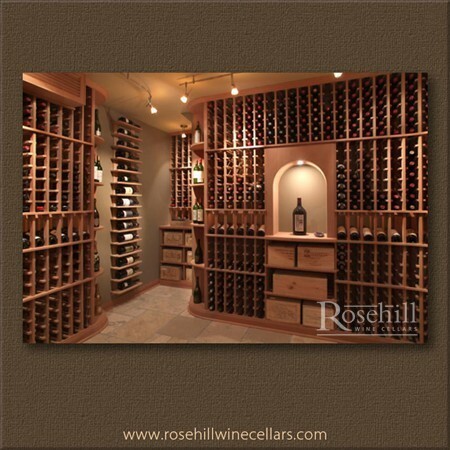 (SL) This custom wine cellar is designed with label out display shelves on the feature wall. 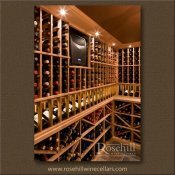 This wine cellar is maximized with individual bottle storage in the majority of both the upper and lower storage areas. The lower section also has space for shorter wood cases. Notice the milk glass style hanging chandelier above tasting table. 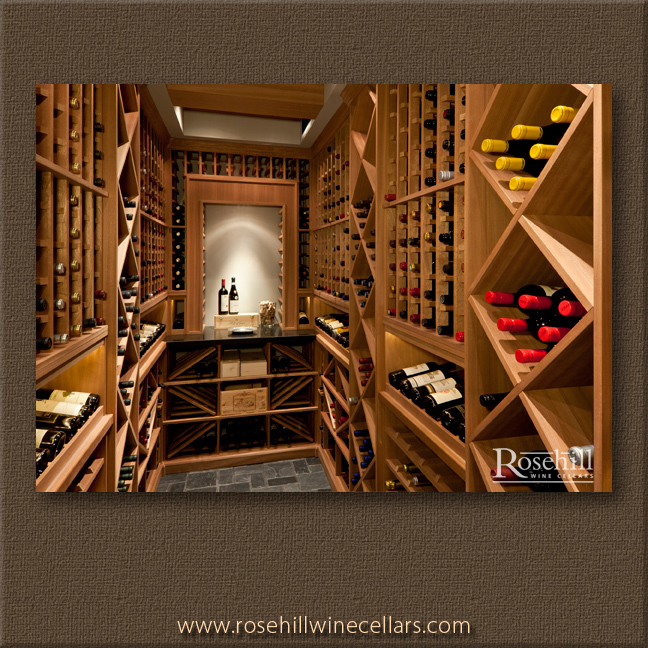 Wooden wine racks and custom display features make this both a functional and beautiful cellar. 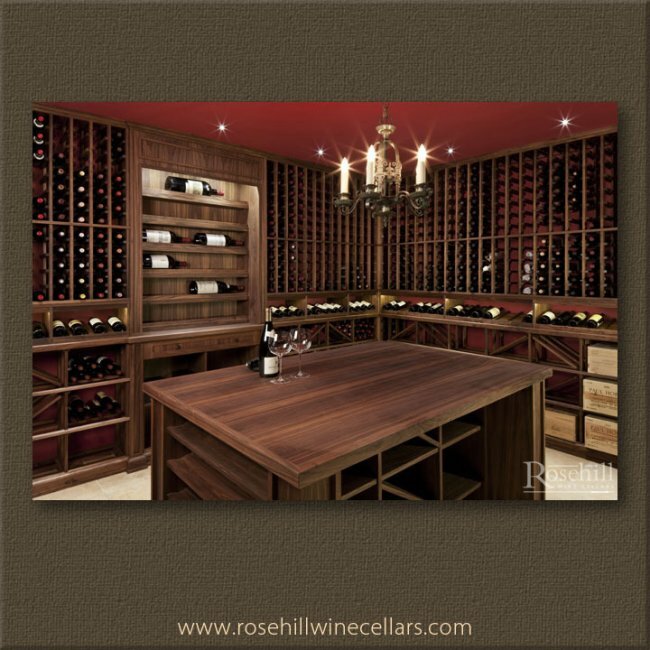 (SL) This custom wine cellar features a oversized tasting table. A stand alone table of this size provides plenty of space for you and your guests to spread out and enjoy some of your finer vintages. Maximizing the footprint of this tasting table, we have also incorporated under the table storage in this layout. 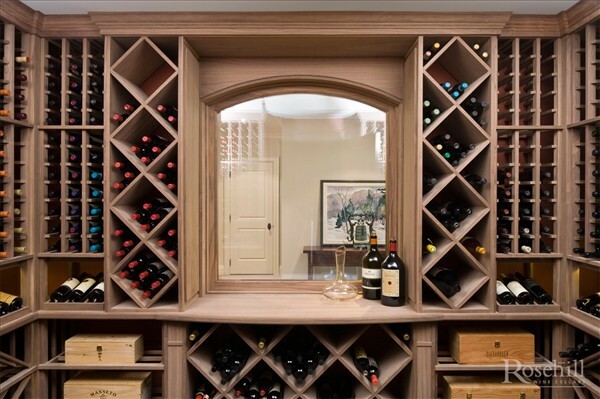 Wood wine racks lend a traditional feel to this custom wine cellar. 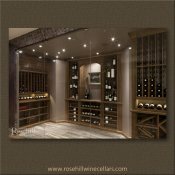 (SL) Showcase some of your finer vintages with this stunning display shelving within your custom wine cellar. This shelving allow for horizontal storage, allowing you to prominently display the labels of some of your collection. The rail counter provides visual interest as well as an extended shelf along the side wall of this cellar. 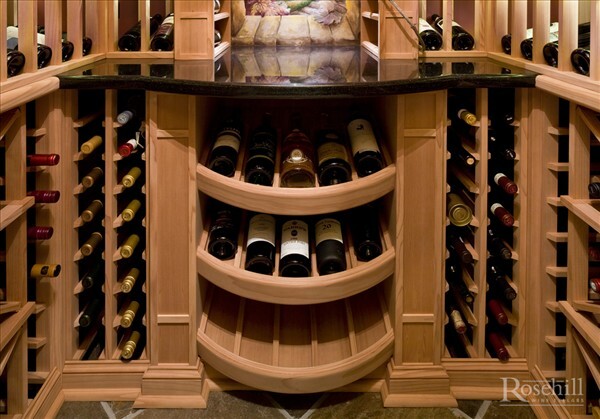 (SL) Separating your upper and lower wine racks is an angle display and rail counter. This angle display, provides a wonderful visual separation for the upper and lower storage areas. 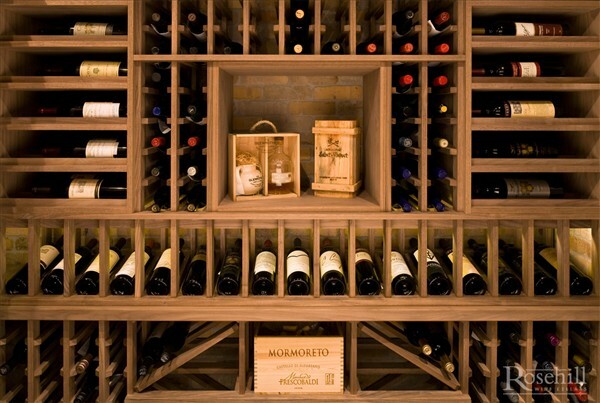 Display some of your wine collection and feature some of your finest vintages. Sample a bottle of your choice without taking an extra step, with the aid of your rail counter or centre tasting table. 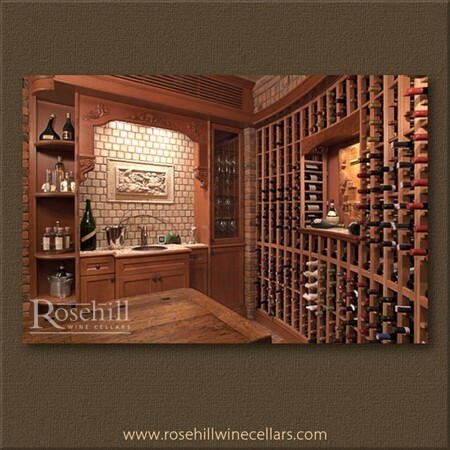 (SL) This tasting niche features a marble counter top with bulk wine storage underneath. This narrow wine cellar is still able to have a small tasting niche within the cellar. Antique looking wrought iron pendant light hangs over tasting table. 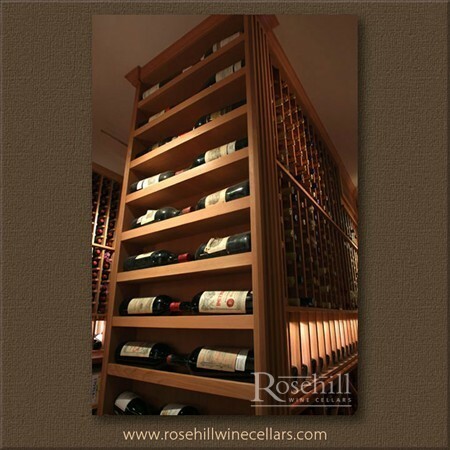 Illuminated angle displays in the wooden wine racks allow feature bottles to be showcased. Notice the grills for cooling unit behind the pendant light. 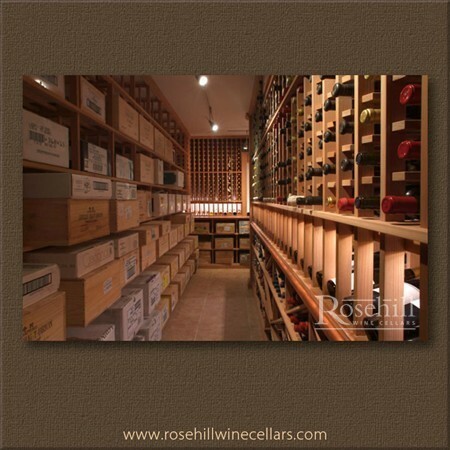 This is a prime example of a climate controlled cellar with hidden cooling system. 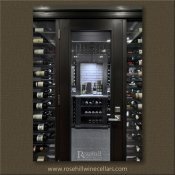 (SL) Your cooling unit blends seamlessly within this custom wine cellar, allowing the wine aficionado to enjoy the space focusing on the wine racks and wine. 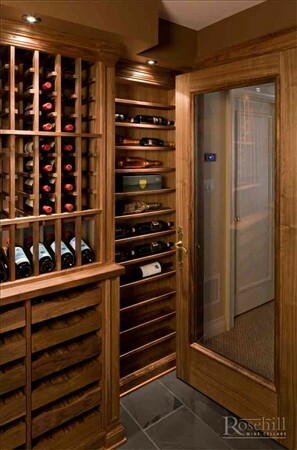 The wine cellar cooling unit is hidden behind custom wood grills to allow the cellar itself to be the star. 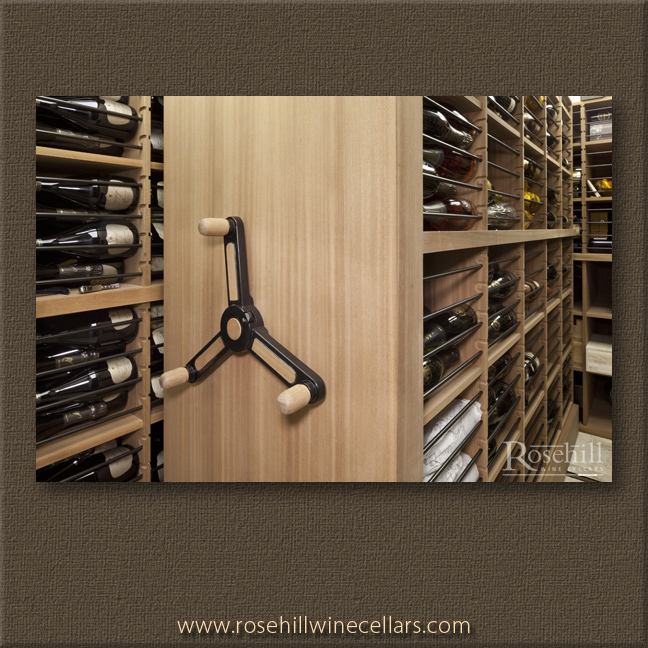 Individual bottle storage wooden wine racks feature an angle display and run continuously from floor to ceiling. 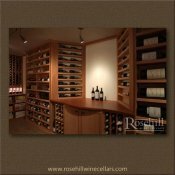 (SL) A wrap around counter top is featured in this custom wine cellar to provide both functionality and separation of the lower and upper wine storage. 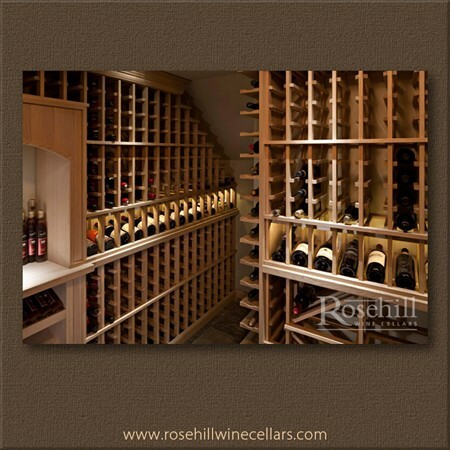 The lower wine storage includes, both individual bottle storage and diamond bin bulk storage. 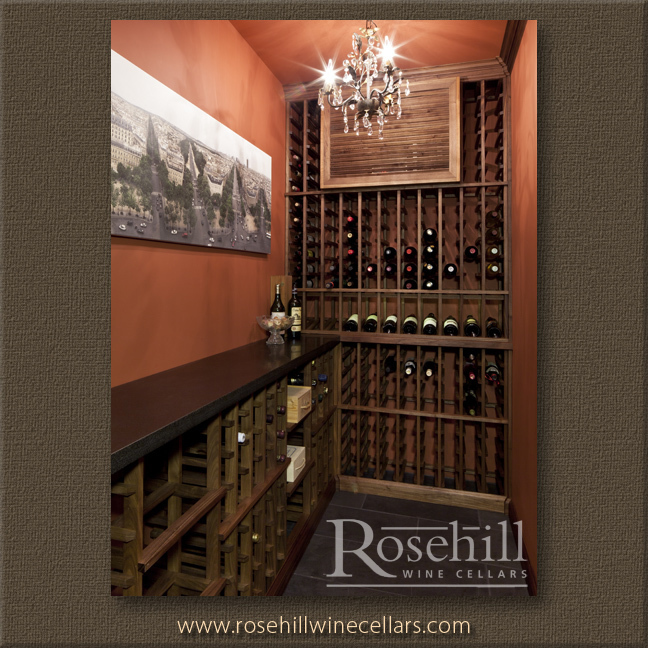 Above the counter top we have both angled display racks with recessed lighting, and individual wine storage. Stonework is also a feature within the curved arch niche. 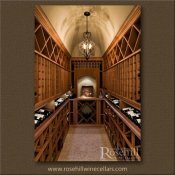 An additional focal point within this custom wine cellar is the redwood clad beams in the ceiling. 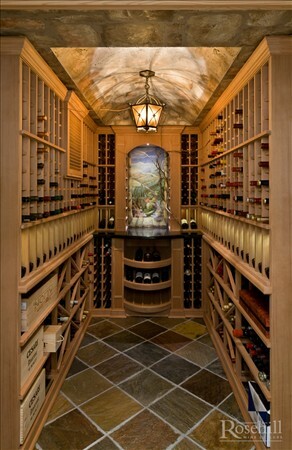 (SL) A raised arch ceiling and pot lights help to illuminate this stunning custom wine cellar. The eye is automatically drawn to the dramatic arched ceiling with a majestic centerpiece light fixture. 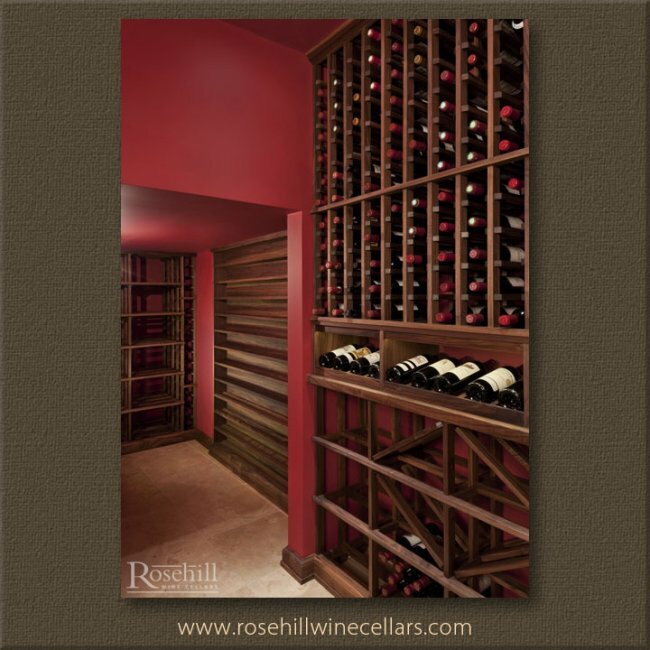 A small sized wine cellar can carry a enticing ambiance with the right lighting. 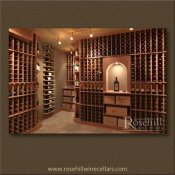 This custom wine cellar boasts both significant wooden individual bottle wine storage, bulk diamond bins and horizontal box storage in the lower area. The individual bottle with angled display storage on each of the side walls created a calm sense of symmetry. Rounding out the space on back wall you have a granite tasting counter accented with an archway, this is flanked by individual bottle storage with bottle tops facing out. 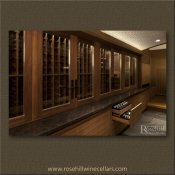 (SL) This custom wine cellar features a large tasting island which is expansive enough to incorporate a brass finished sink. The sink allows for an in cellar spittoon or clean up area for glasses and other wine accessories. The island also provides addition storage with both pullout drawers and closed cabinet storage in the lower section. Accenting this island is an ornate lighting fixture. The climate controlled traditional cellar is cooled with a ducted system, hidden behind a wooden grill to the left of the image. (SL) Upper storage area of the wooden wine racks is highlighted with 3 banks of presentation shelving along one wall. What an impactful way to showcase your prized collection. 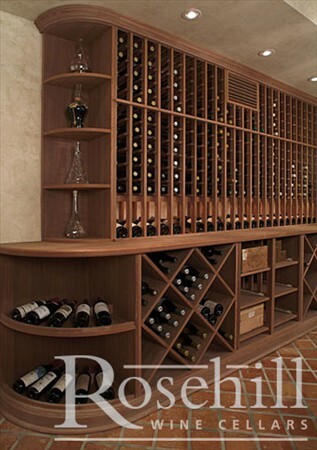 Individual bottle storage wine racks takes up the upper third of this wine wall. Wood case and diamond bin storage are on the lower level. The adjacent wall captures visual interest with one single row of a presentation racks and the upper portion for single bottle individual storage. This collector inventories their wine with neck tags. Note the crystal wine decanter & funnels for easy access in the cellar. 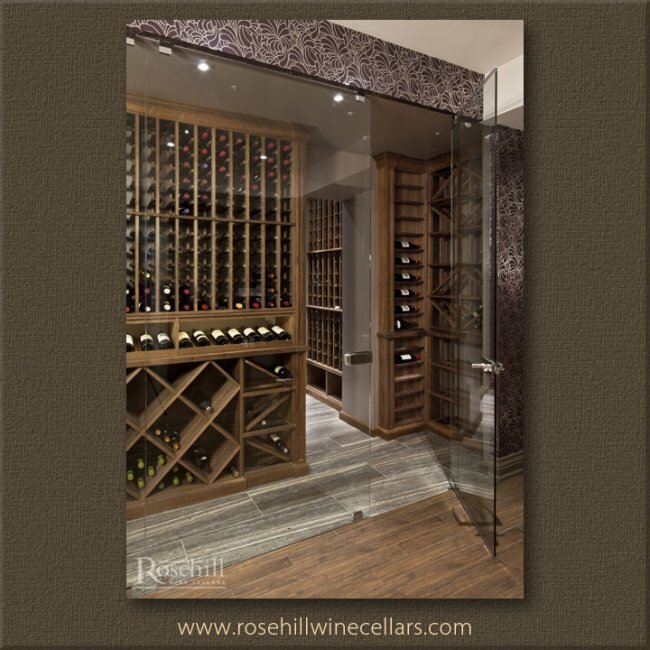 (SL) Providing the best of both worlds, this area of the custom wine cellar boasts lower horizontal wood case storage with upper section for individual bottle storage and presentation racks. The wooden racking in redwood features three rows of presentation shelving storage to display the vintages that matter most. 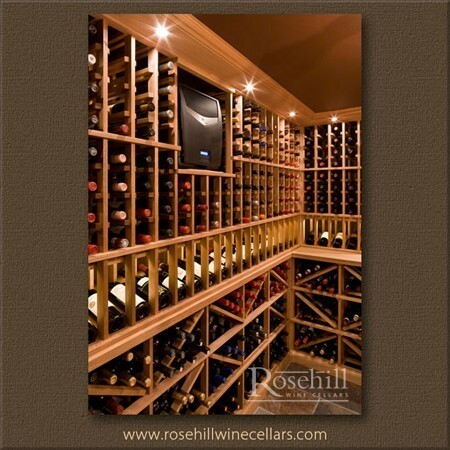 Versatility of racking allows the wine collector to showcase many of their prized bottles. (SL) An End Cap display rounds out this end of the custom wine cellar and is visible from the glass window outside of the cellar. The custom end cap incorporates both smaller and larger quarter round. The lower quarter round is deep enough to display multiple bottles in semi-circle formation. Wooden Diamond bin and horizontal Bordeaux case storage make up the remainder of the lower storage. Upper storage incorporates both single bottle individual and presentation storage areas. The cooling unit is seamlessly camouflaged by wooden grill and blends into the surrounding racks. 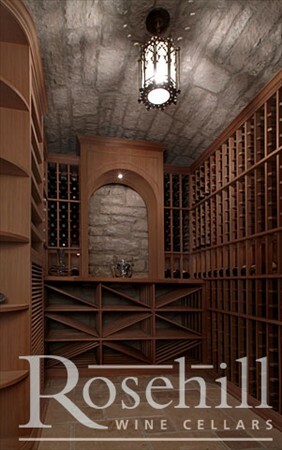 (SL) A stonework, barrelled ceiling is a feature standout within this custom wine cellar. The stonework carries through the cellar as a feature on the back wall, accenting the archway tasting niche. The wine racking is comprised of lower diamond bins, individual single bottle storage plus quarter round shelving to act as decorative end cap. The climate controlling cooling unit is camouflaged by wooden grill. Adding to a medieval feel, lighting is accented with a cylindrical ornate light fixture. 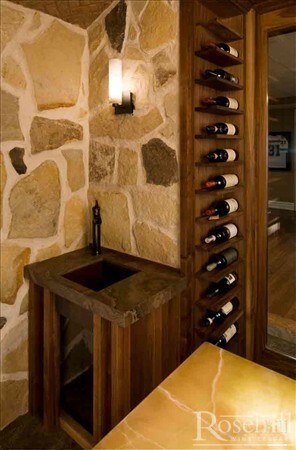 (SL) A rustic statement is made with the use of reclaimed Douglas Fir in this custom wine cellar. 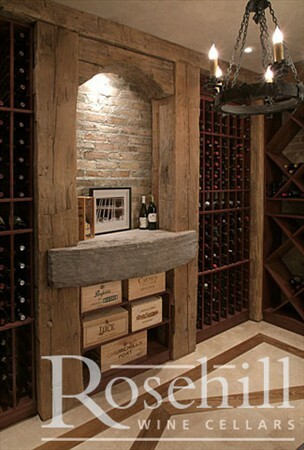 Reclaimed Douglas Fir beams and decorative columns are definitely the star of this cellar. Ornate vintage wrought iron chandelier really brings this room to life. Stone counter top in niche allows for primitive but elegant tasting niche. 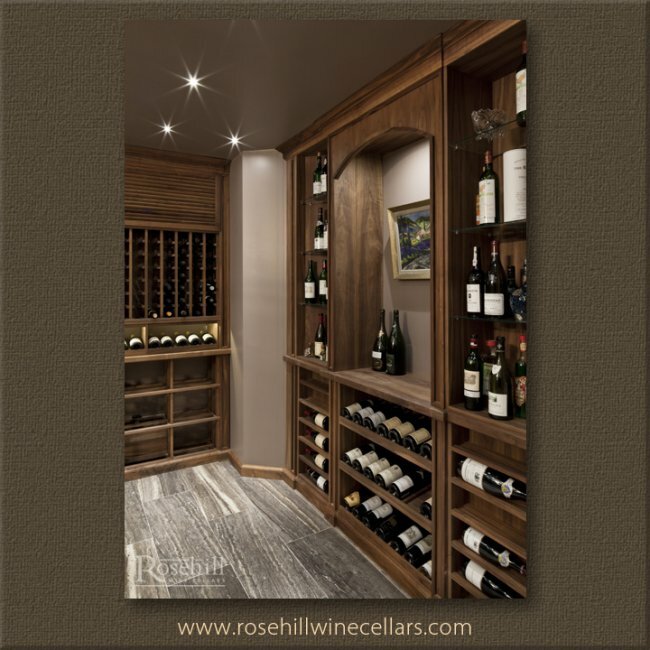 The cellar combines a variety of wine racking styles including individual single bottle, diamond bins and wood case bin storage. 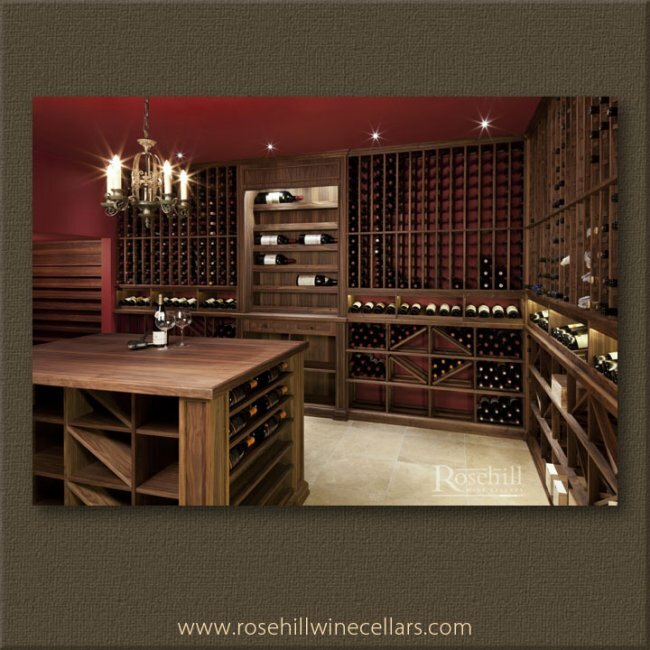 A gorgeous and functional cellar that provides ample storage options for any collector. (SL) The tasting niche in this custom wine cellar boasts a massive stone counter block and curved arch in reclaimed wood. The niche creates a perfect recessed area for wood case bins. Single bottle storage on either side of the arch allows for vertical storage, the diamond bins allows for more bulk storage. Vintage wrought iron chandelier came indirectly from HorseFeathers in Toronto. (SL) Horizontal wood case bins are used for both wood case storage and larger format bottle display. 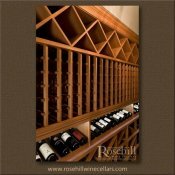 This custom wine cellar also features wood wine racks for individual bottle storage, plus diamond bins in the lower area. A wrought iron gate provides access to the cellar. Other decorative details to note are a stone wall to the left, plaster effect on the ceiling and tile floors laid on the diagonal. 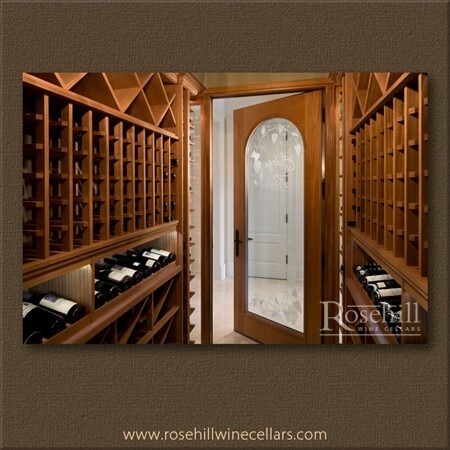 The entrance to this wine cellar features a stunning custom door. 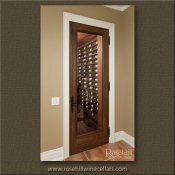 The maple door features both glass window and wrought iron to provide decorative statement for cellar entrance. Display end cap by the cellar entrance features shelving for special bottles. The racking layout is comprised of individual single bottle and diamond bin storage. Once inside the cellar, the wine aficionado need not leave. Over and above the wine storage compartments this custom wine cellar boasts a corner sink with under the counter storage. The upper cabinet features double glass doors for wine glasses or other paraphernalia. Lower baseboard trim throughout the cellar is finished with custom height baseboards for a eye-catching look. 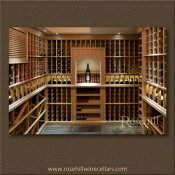 (SL) This large residential wine cellar will accommodate your current and future inventory needs. The bottle count is dominated with two main types of storage, individual single bottle and diamond bin storage. The racks are recessed under existing bulkhead. Custom height baseboard finishes the lower storage area for a floor to ceiling finished look. 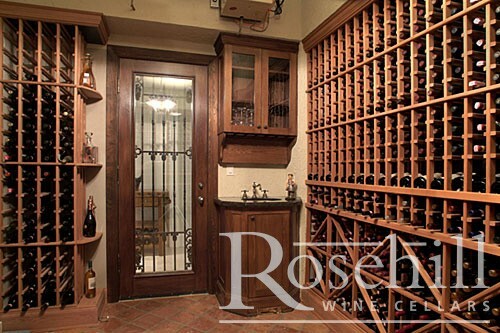 This wine cellar is complemented by stone flooring and wrought iron entrance. 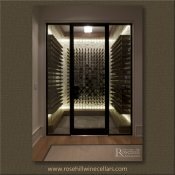 (SL) A unique feature of this custom wine cellar is the wrought iron entrance. Once inside, your storage needs are met and exceeded, with individual single bottle wine racks and diamond bin storage in California Redwood. The massive bottle count storage will accommodate your current and future inventory needs. (SL) The herringbone design flooring may get your attention, but it’s the orange accent wall and decorative lighting sconces that steal the show in this custom wine cellar. This artistic feeling cellar with a zen twist and sense of calm allows for a wine storage paradise. Floor to ceiling vertical diamond bins flanked by other wood racking provides a variety of storage options. This custom wine cellar also features a rail counter throughout and extra deep tasting niche; a perfect area for wood case storage underneath. Upper storage includes horizontal displays for label viewing of bottles. The racks featured are both individual single bottle storage, presentation storage and diamond bins. 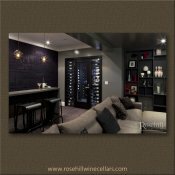 (SL) A lighter look for this custom wine cellar provides a clean and modern look. The white oak racking complements the slate flooring tile. Amongst the back wall of the cellar are individual bottle storage racks with angled bottle display. Diamond bins racks and wooden case storage cover two walls of the cellar. Left side of the cellar, you have individual single bottle storage, from floor to ceiling. Note how the upper racks are recessed back, ever so slightly throughout the cellar. 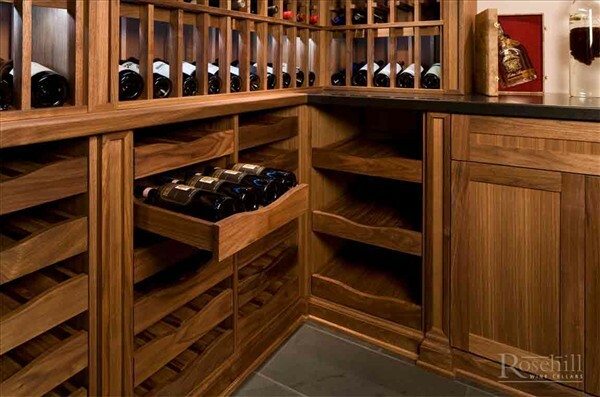 This wine cellar features custom wine racking in unstained white oak. Solid diamond bins allows for full bottle depth storage in completely separate compartments. Angled presentation storage runs below the individual bottle racks with more open bin storage below. Floor to ceiling racking is achieved with wider crown moulding to open ceiling. (SL) White oak wood grill is incorporated into the racking to camouflage the cellar cooling unit. 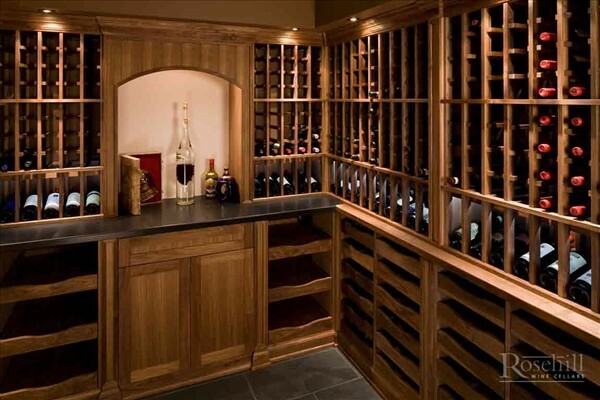 Let the racks and wine be the star of the show by helping the cooling system to blend into the woodwork. This stunning White Oak wine cellar is designed with a variety of racking to create a balance of diamond bin bulk storage in the lower half and individual bottle storage above. Part way up in the racking you have presentation storage for special bottles. A coffered ceiling allows for visual interest in the cellar and hides duct work. (SL) The feature wall in this white oak custom wine cellar provides an extra deep tasting niche looking out to the adjacent family room. This niche is flanked by vertical diamond bin storage on either side to create symmetry. Underneath the tasting niche, there is more traditional diamond bin storage and horizontal wooden box storage. 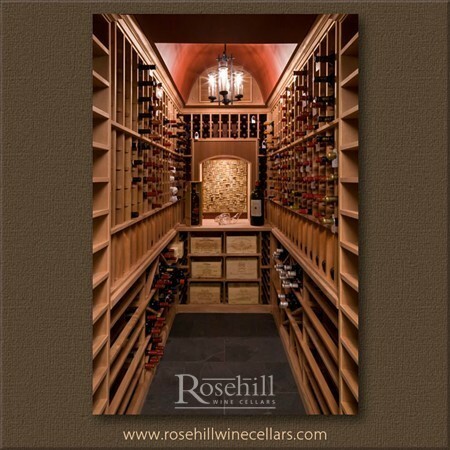 This beautiful custom wine cellar has a gray slate floor with redwood custom racking and neutral walls. The wine storage design features floor to ceiling solid diamond bins and a divider for more storage. 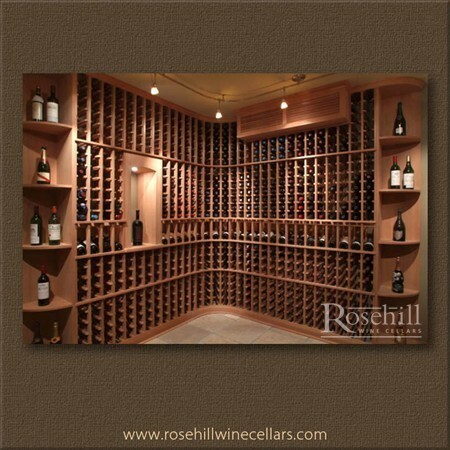 Upper storage includes individual single bottle storage and presentation display racking. Below the rail features case bins with wooden slats to create diamond bins for open bulk storage. Notice the beamed ceiling detail and custom redwood exterior grade door, with glass inlay and black metal rustic hardware. 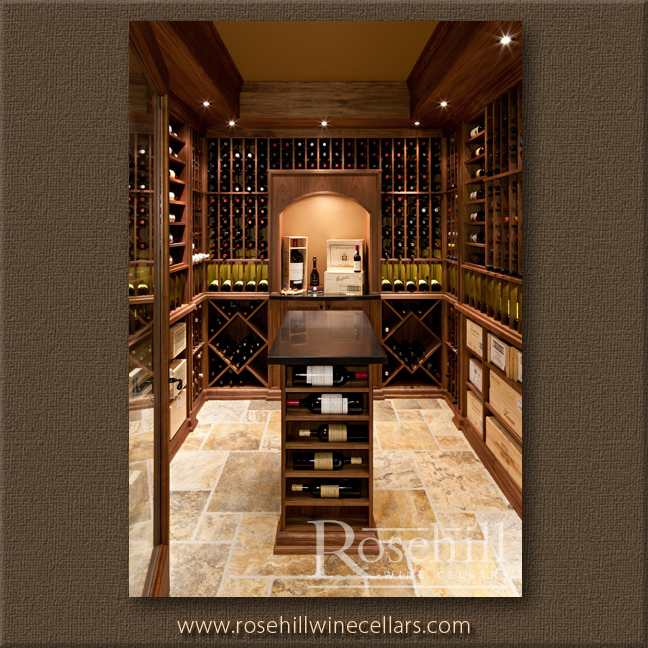 This stunning custom wine cellar features redwood diamond bins and a tasting niche with gray slate flooring. Custom bins are generally solid as opposed to wooden slats. (SL) This image shows a close up reveal of rounded triple height wooden display in custom wine cellar. The granite counter top tasting niche is beautifully accented with three levels of display wine storage underneath. The rounded display storage is matched to the rounded counter top above. Wooden racking for dessert wine and half bottles flank the lower display area. (SL) This massive wine collectors paradise had me at hello. 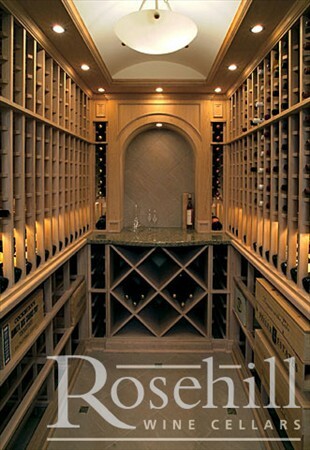 For the collector that has everything this is the ultimate in a residential wine cellar. 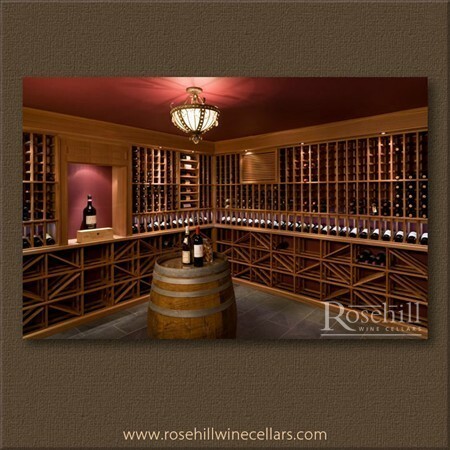 With multiple tasting niches the party can start and finish without leaving this wine cave. In the centre of the cellar we have a granite oval standalone island, with lower cabinet storage for accessories and stemware. Along the back wall there are double diamond bin storage in the lower section with two levels of presentation and individual single bottle storage above. The niche itself is extra deep with an arched display. A wooden grill cover camouflages the climate controlling cooling unit. Within the side walls of the cellar, there are quarter round display shelving and horizontal bottle storage. 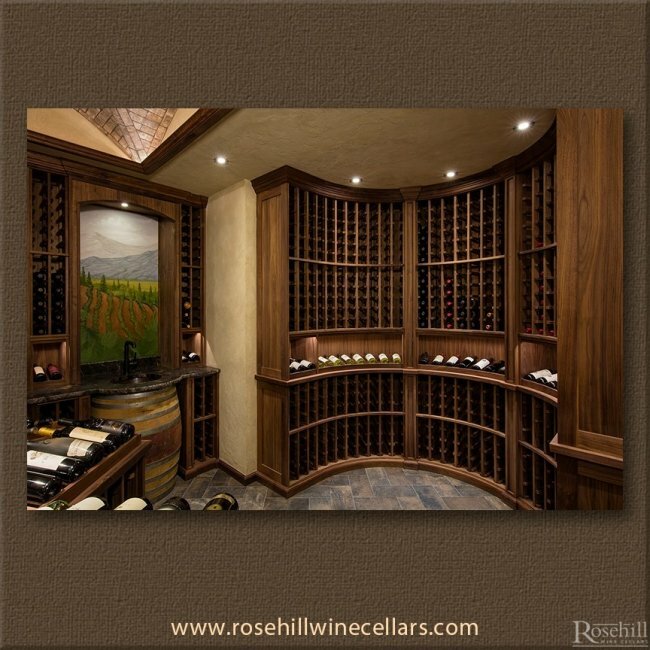 Each side of the cellar incorporates two additional tasting niches. 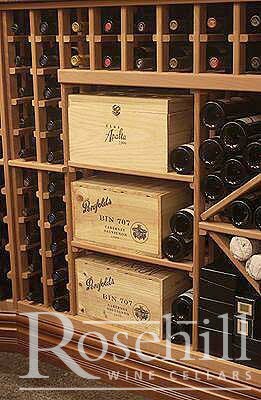 Deep horizontal bottle storage for either wooden cases, or larger individual bottles like champagne wrap up the lower storage section. 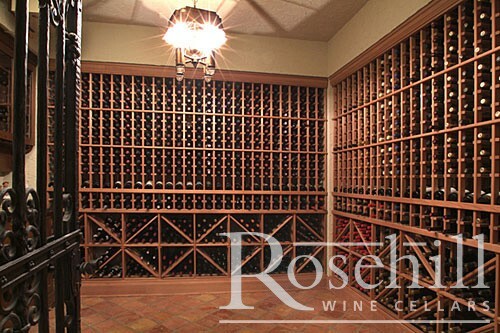 Large format bottles can easily find a home within various areas of this cellar. The eyes are also drawn to the top of the cellar where we have extra high custom crown moulding to allow floor to ceiling continuation of racking. The mood is set in this spectacular wine cellar with LED lighting and a nine light pendant ceiling fixture. 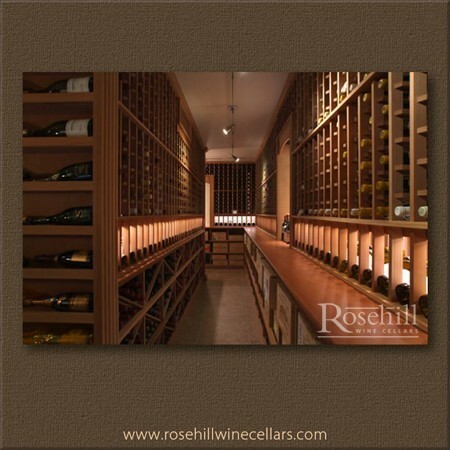 (SL) This spectacular wine cellar with adjacent tasting niche has a modern feel. The dark stained maple wine racks gets your attention with its warm tones and complements the adjacent seating area. Captured behind a glass front this wine collection is on full display. Featured in the lower area is storage for horizontal wood cases and individual bottle storage. A tasting niche with artwork is the focal point of the rear wall. To bring some brightness to the room, the ceiling is white with LED lighting featured in the space. 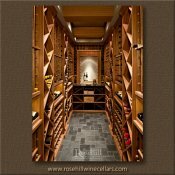 (SL) A unique choice in flooring is leather that works extremely well in this modern custom wine cellar. This collector needed both individual and wood case storage so maple wine racks with a dark stain work well in his space. Ductwork grill for the wine cellar cooling unit can be seen in the upper left side of this image. 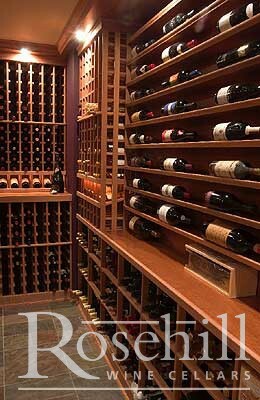 (SL) This image shows close up angle of the dark stained maple wine racks in custom wine cellar. 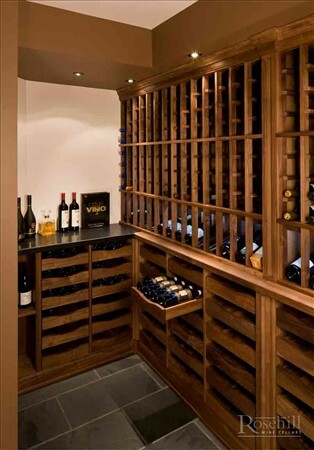 Simple crown moulding provides floor to ceiling continuation of racking in this modern cellar. 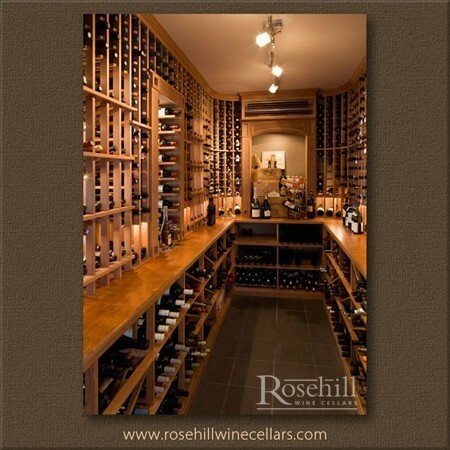 A row of presentation storage is maintained throughout the cellar to highlight select bottles of wine. (SL) The calming look of the red bottle wraps and red in the art work provide a perfect balance to the dark stained maple wine racks. Look at this picture long enough, mesmerizing really….. 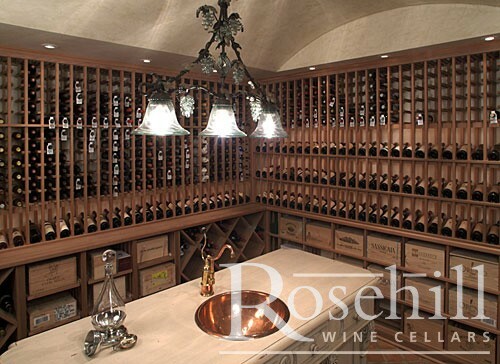 Individual bottle storage makes up the majority of the upper zone in this custom wine cellar. 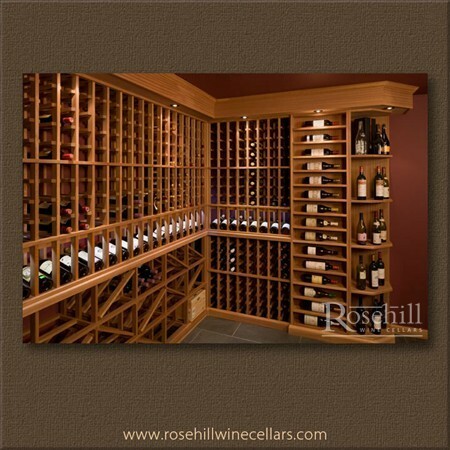 (SL) This glass fronted wine cellar features custom wine racks in Sapele Mahogany. 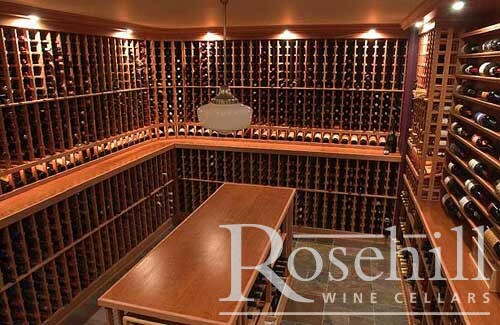 This open feeling wine cellar has considerable storage in both the upper and lower areas. Throughout the lower area features more bin storage with both diamond and wood case bins. The upper storage features individual bottle storage with presentation display. 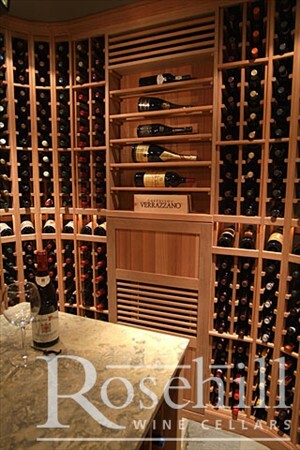 Within the tasting niche, cooling unit for the wine cellar is seamlessly integrated with a wooden grill cover. (SL) A closer look at this custom Sapele cellar inside of the glass doors. Note the wood grill above the tasting niche hides the ducted vent for the wine cellar's cooling unit. Wine storage is featured in both individual and bin storage. The diamond and wood case bins are in solid wood running the depth of the wine rack. (SL) Track lighting provides a spotlight on key areas of the cellar. 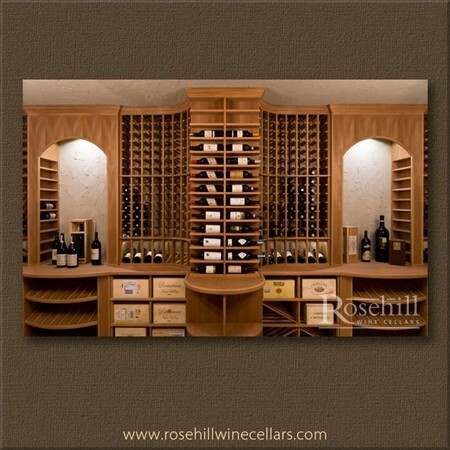 This wine cellar features presentation display, wood case bins and individual bottle storage. (SL) Take full advantage of your space to incorporate more than just wine. 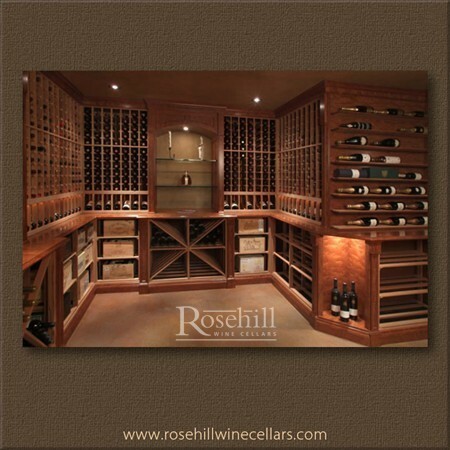 This custom wine cellar notches out an area to provide for tasting & display of feature bottles. A granite counter top with display storage for sprits has used the less expensive Modular Racking F06 bin racks with glass shelving insert. Below the countertop, wood case storage is custom created. 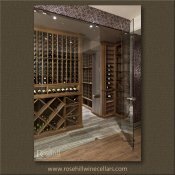 (SL) A feature display tasting niche at the end of what appears to be a hallway is the centrepiece for this custom wine cellar. The extra deep granite counter top supports a lower double door cabinet to hold decanters, stemware and other wine accessories. 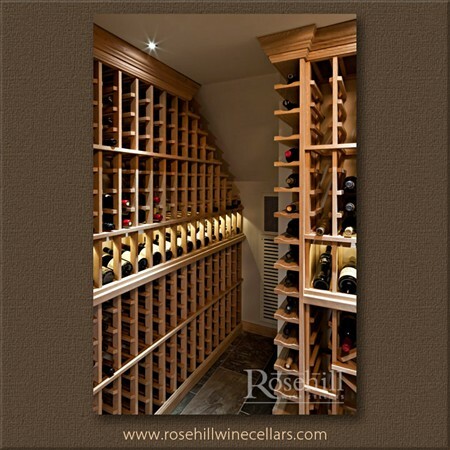 This T shaped wine cellar features a spectacular entrance area with small niches to the side. 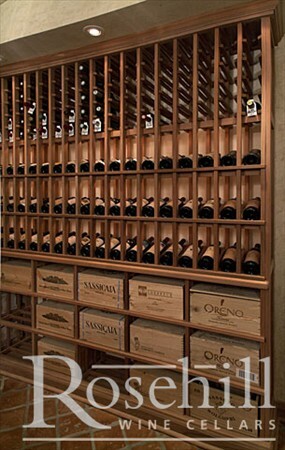 The wine racks for the cellar look more like custom cabinet displays as opposed to traditional wine racks. 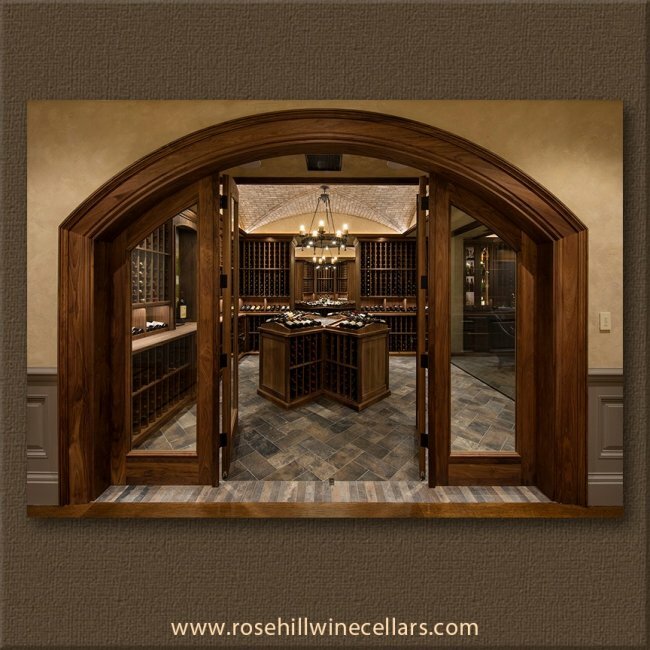 Beautiful slate flooring & arched ceiling further enhance the overall look and feel of the cellar. 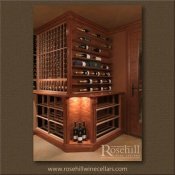 (SL) The corner section of this custom wine cellar provides individual bottle storage and counter height horizontal display. Storage for Bordeaux box cases make up the lower storage areas. The custom sized wine racks are a great way to take advantage of the small space available within this custom wine cellar. 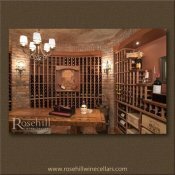 (SL) This custom wine cellar in walnut features a bricked wall tasting niche with individual bottle and open display storage To create a symmetrical effect, below the tasting niche is a diamond bin flanked by individual bottle storage and presentation racks. Along the side walls of this climate controlled cellar are presentation display storage incorporated at counter height with box niche displays. Notice the brickwork in the niche runs one way while in the floor the slate is laid the opposite way. 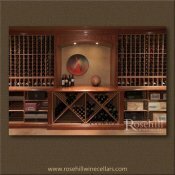 (SL) This custom wine cellar features display presentation storage at the perfect level for full viewing at counter height. The remainder of the upper storage provides individual bottle storage with lower storage in combined diamond bins and individual bottle storage. A wooden grill cover to the left of the image camouflages the cellars’ cooling unit. The focal point is the arched display and tasting niche with display shelving directly below. Slate flooring and LED lighting bring the entire look of the wine room together. 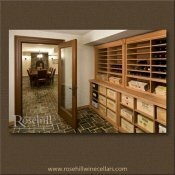 (SL) Maximizing all of the available space is achieved in this custom wine cellar. The design accommodates the sloping ceiling under the stairs with cascade or waterfall of the wine racks. In this custom application we have used single bottle storage with a presentation row. Looking at the previous image, you don’t realize the extra space to the right of the cellar is the area under the stairs. We’ve maximized both the space and bottle count for this potentially awkward space. (SL) When a jut out or odd wall comes into play a single bottle display storage, may be the answer. Used here in the right side of the cellar the label display wine rack finishes off the wall rather nicely. 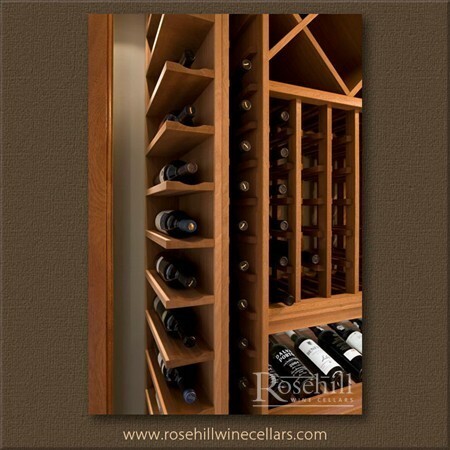 The end cap wine racks adds to the bottle count and eliminates blank wall space. Custom Double Deep Diamond and wood case bins allow for plenty of bulk storage within this custom wine cellar. Bin storage is featured throughout the entire lower area of the cellar with 750ml Individual Bottle racking above. 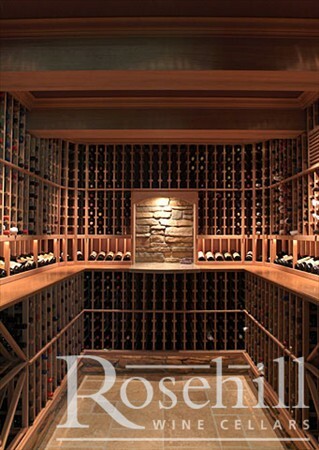 (SL) A main feature over and above the racking in this custom wine cellar is the magnificent barrelled ceiling. 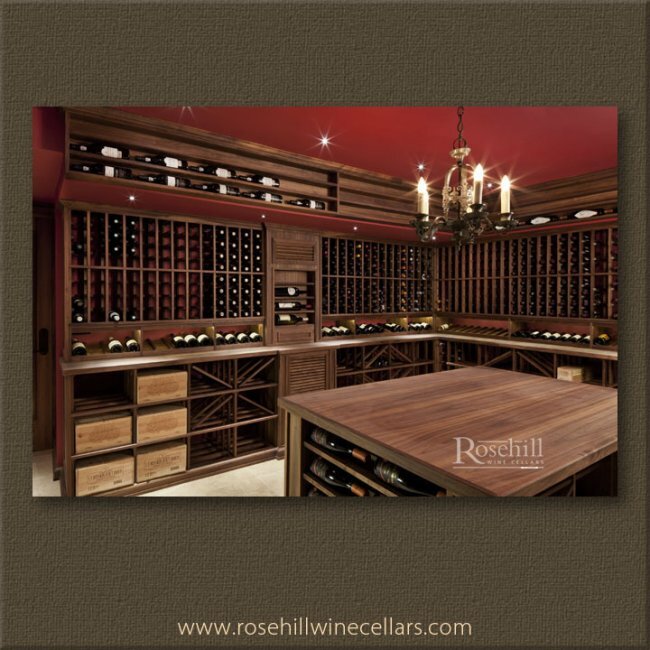 The raised ceiling helps to create an opulent feeling that only enhances the vintages stored below. 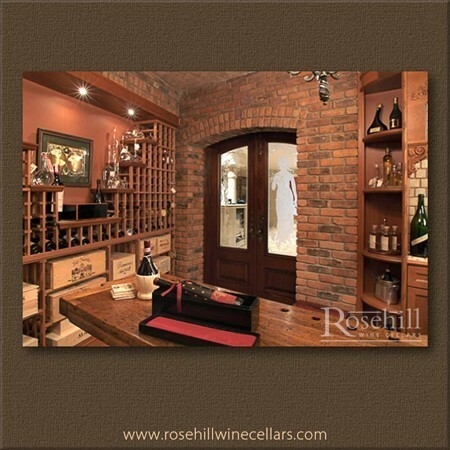 Sampling in this cellar is accommodated at the arched tasting niche with inlay mural. Individual single bottle storage and presentation display storage make up the upper areas of the cellar, with diamond bin storage and wood case bin storage below. A custom wood grill cover to the left of the image helps to camouflage the cellar cooling unit. 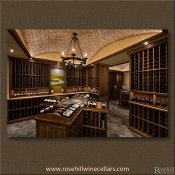 (SL) Decorative touch of retired grape vines reaching for the barrel ceiling above enhances the look of this custom wine cellar. 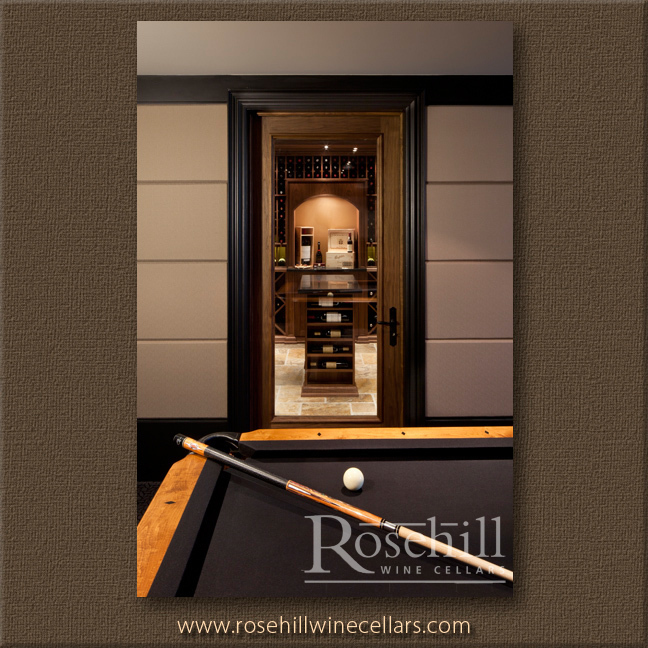 Painted ceiling detail and artwork within the niche provide a custom appeal to this residential wine cellar. 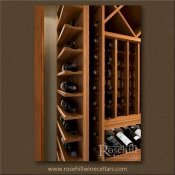 The extra deep tasting niche allows resting place for uncrating wine boxes. 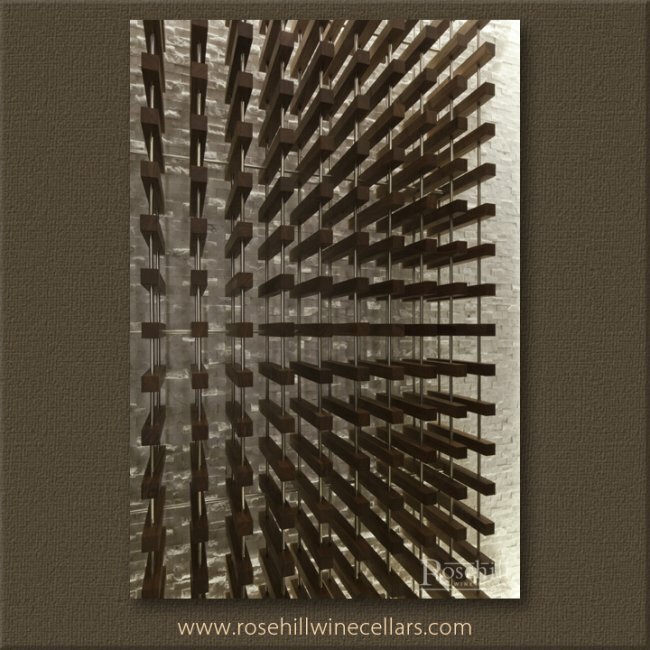 Horizontal display storage is incorporated to either side of the arch with presentation storage running throughout the cellar. 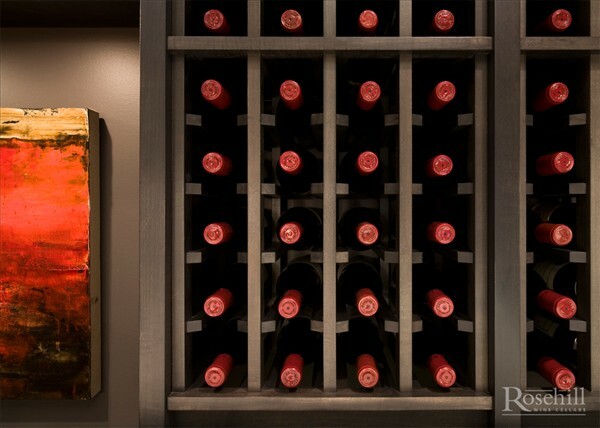 The redwood wine racks provide a clean backdrop to showcase the customer’s collection and artistic flair. 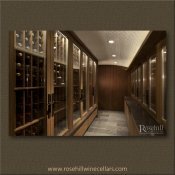 (SL) This commercial custom wine cellar provides restaurant customers with a small window to the left for viewing the wine collection within. 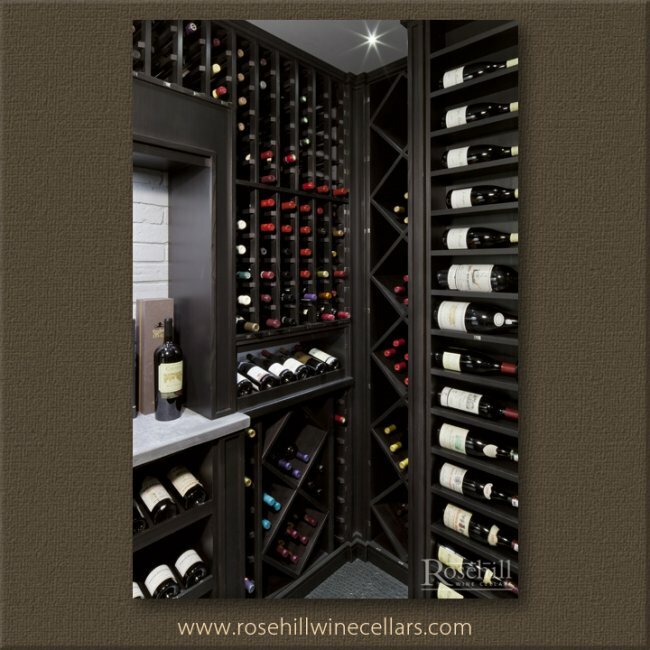 The cellar is built for both functionality and aesthetic appeal with the upper section of wine racks in mainly individual bottle storage while the lower section is double deep bulk bins. Bulk bins are ideal for commercial settings to store like bottles within. 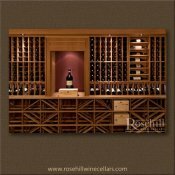 Having the double deep storage around the entire perimeter of the wine room allows for extended wooden counter top with plenty of space to un-crate bottles. The ductwork for the climate controlling cooling unit is located above the niche at the end of the cellar. 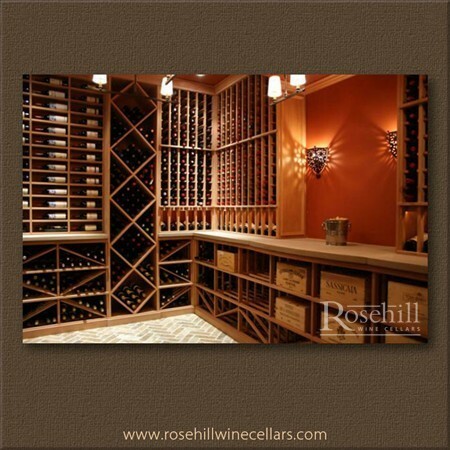 Located high up and hidden with wood trim, the cooling unit blends into the cellar itself. 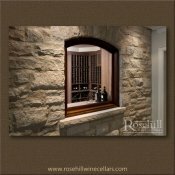 (SL) Incorporated with a picture view in and out of the custom wine cellar this window niche provides a small glimpse of the wine collection. 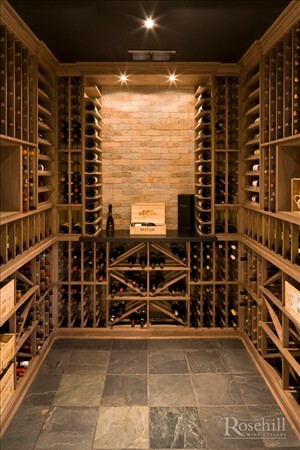 As solid walls provide better insulation, some collectors prefer to minimize the amount of glass within the wine cellar. 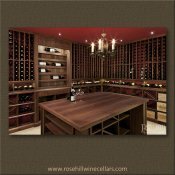 The double deep wooden tasting table runs around the perimeter of the room in this commercial wine cellar. (SL) Vertical diamond bins are flanked on either side of the tasting niche and window to adjacent family room. 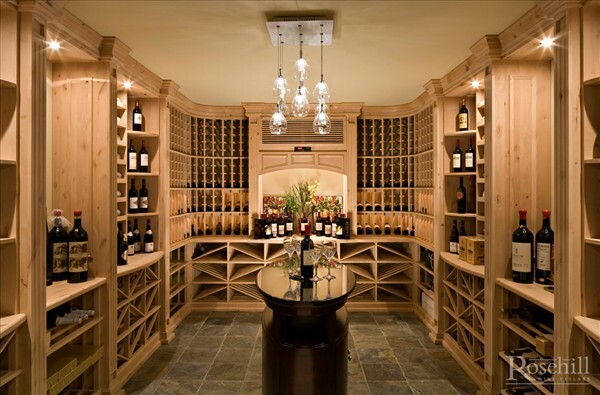 This custom residential wine cellar boasts symmetry in the wooden millwork. Note the diamond bin pattern is also echoed in the area below the tasting table. Wall to wall and floor to ceiling custom details allows for a mix of racking from individual bottle to wood case bins to presentation racks. 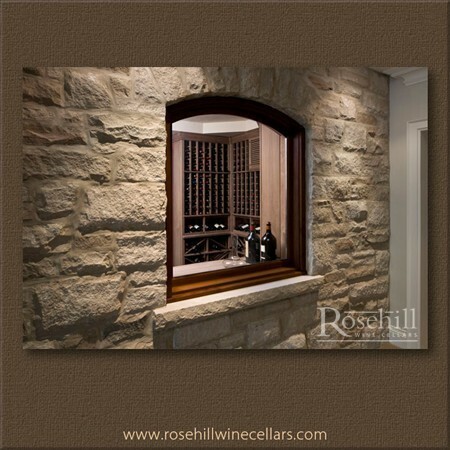 (SL) The custom stone work frames the display window for viewing into the wine cellar. The stone wall also provides a rustic feel for the adjacent family room. The cooling unit for the wine cellar can be seen in the upper right of the wine room. Note the cooling unit is virtually flush with the wine racks to help the cooling unit blend in. 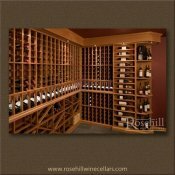 (SL) This large residential cellar is for an avid collector. Wood Wine Case storage dominate the needs of this client so we have incorporated space for a number of wood cases. Some of the bins are oversized to allow multiple boxes into each area. 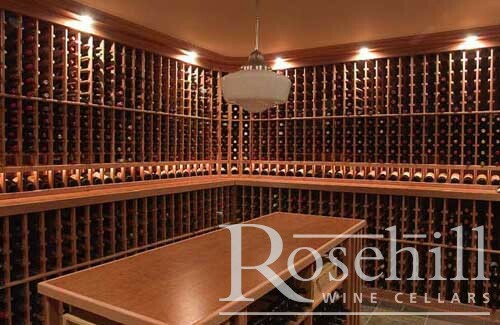 The rest of the cellar allows for redwood racking in a variety of styles with mainly individual bottle storage and diamond bins. 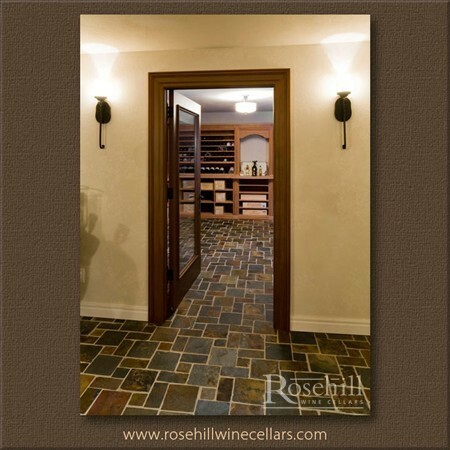 Corridors are created within the wine cellar to maximize space and bottle capacity. 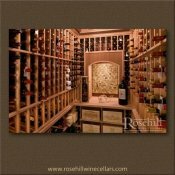 (SL) This wine collector seems to have everything!! Notice the very large format bottles to the right of the tasting niche, we think Jeroboam, but could be Imperial sized bottles. An impressive collection of Magnums is on the far left of the feature wall. 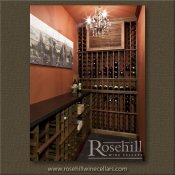 Custom display bottle storage is provided in the upper area of the wine cellar to allow full viewing of the bottle labels. Additional display storage is provided on either side of the tasting niche for 750ml bottles. Directly below the tasting niche is a two door closed cabinet. With a cellar this spectacular, I wonder what art work was eventually hung? (SL) Another corridor to this large residential cellar allows for more wood case storage and additional displays to showcase the expansive wine collection. The custom wooden wine racking on the right is double deep on the bottom to allow for table top counter. Presentation display storage is provided at the same level of the custom wrap around table top shelf. End Cap display for Champagne storage is on the left. 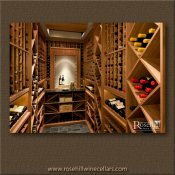 (SL) Maximizing all elements of storage this massive residential wine cellar incorporates floor to ceiling end cap display shelving . Petrus, Chateaux Margaux, anyone? 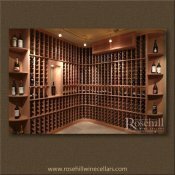 Upper storage to the right of the end cap is redwood wine racks for individual bottle storage with presentation display. (SL) Creating consistency on either side of the cellar is neutral tone tiles. 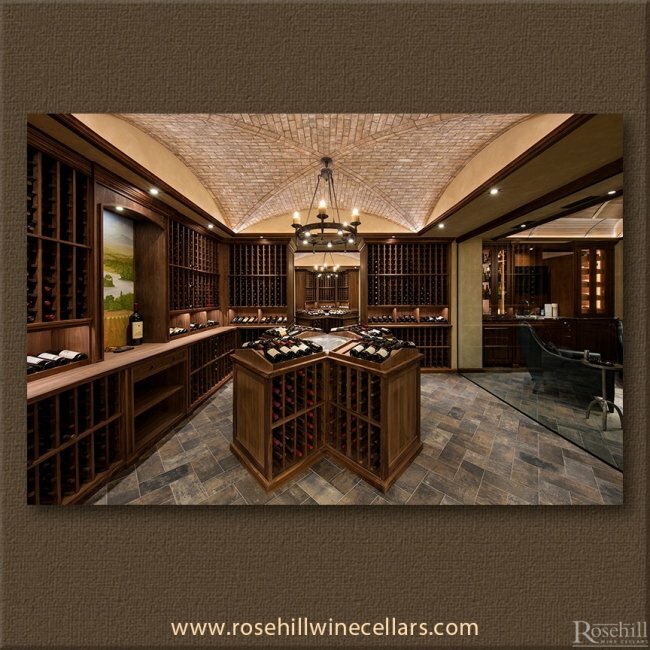 A detailed Mediterranean cobblestone flooring look with slate tiles is featured throughout the Tasting area, and inside the custom wine cellar. (SL) This customer collects an unusually high amount of wood cases so needed racking with custom box storage and perfect climate conditions for their cellar. Presentation Display racking is used through the upper storage zone with wood case storage below. In the arched tasting niche, an extra deep counter top is installed with extended arch counter. 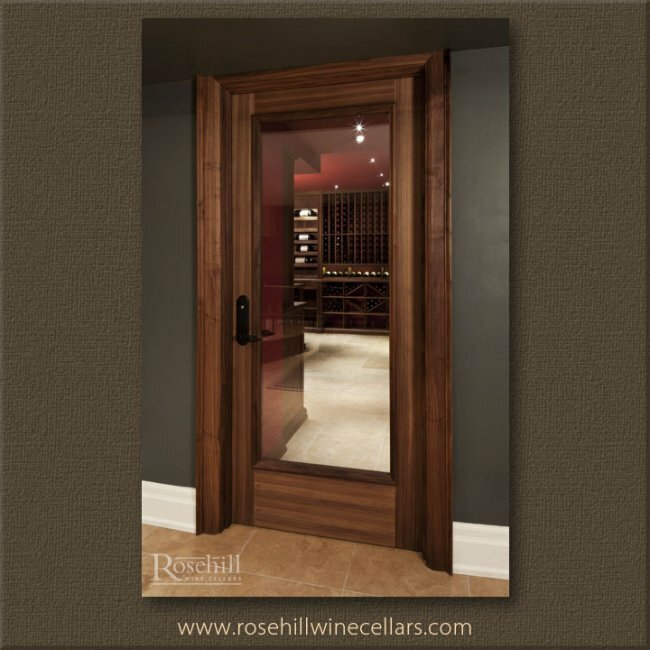 (SL) The entrance to the wine cellar is framed with a dark stained custom door with a glass inlay. This provides great sightlines from inside the cellar, or from the adjacent tasting room. Note, the slate flooring runs continuously throughout the wine themed area. 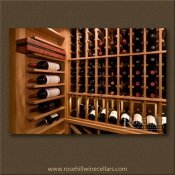 Wooden wine racks accommodate for both wood case storage and presentation racks. Tasting table accommodates 8 people. (SL) Above the custom wooden wine racks, LED lighting illuminates this residential wine cellar. An ornate black wrought iron chandelier hangs above a recycled wine barrel acting as a tasting barrel. 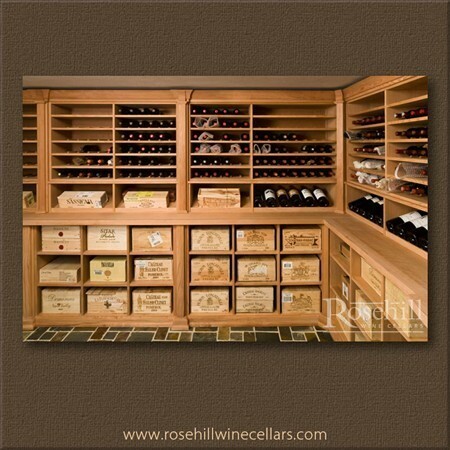 This custom cellar storage features, lower diamond bins and wood case bins. At and above the chair rail is an extra wide tasting niche at the back wall of the cellar. 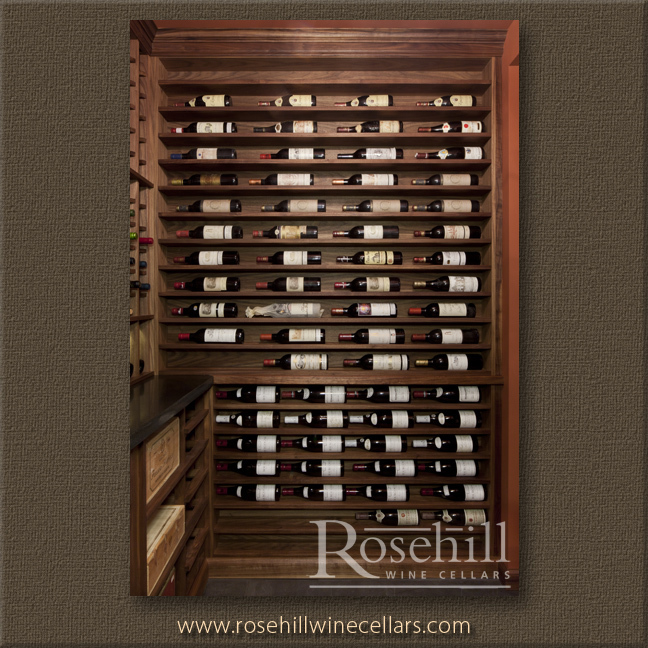 The upper storage provides a combination of presentation display racking and individual single bottle storage. 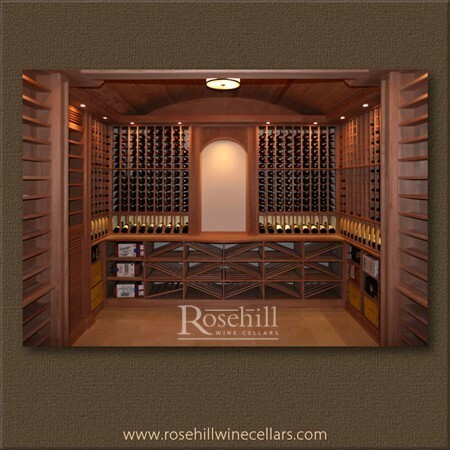 (SL) This custom wine cellar features two types of presentation display racking to best showcase wine bottle labels. The wood wine racks are designed with both individual single bottle storage in pigeon hole type of slots with angled display below. On the adjacent wall there is horizontal individual display storage run floor to ceiling. The label out format of this presentation display has scalloped shelves to cradle the bottle. (SL) A Wine Guardian TTW Through the Wall wine cellar cooling unit is housed within the racking. This is an ideal installation as the cooling unit is incorporated within the racking to blend into the cellar. Diamond Bin storage take up the entire lower area of this custom wine cellar, providing ample storage for bulk purchases within same vintage. 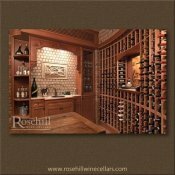 Above the rail and counter is a single row presentation display followed with individual single bottle storage make up the upper area of this custom wine cellar. 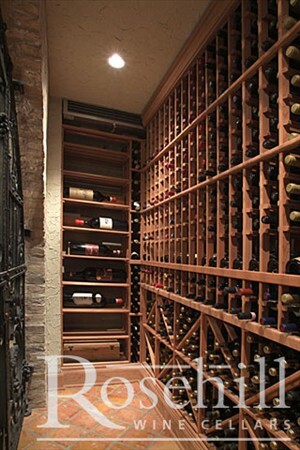 (SL) The walls of the custom wine cellar are bricked with wooden racking inserted within. A solid hardwood island from reclaimed wood sits in the middle of this climate controlled space. 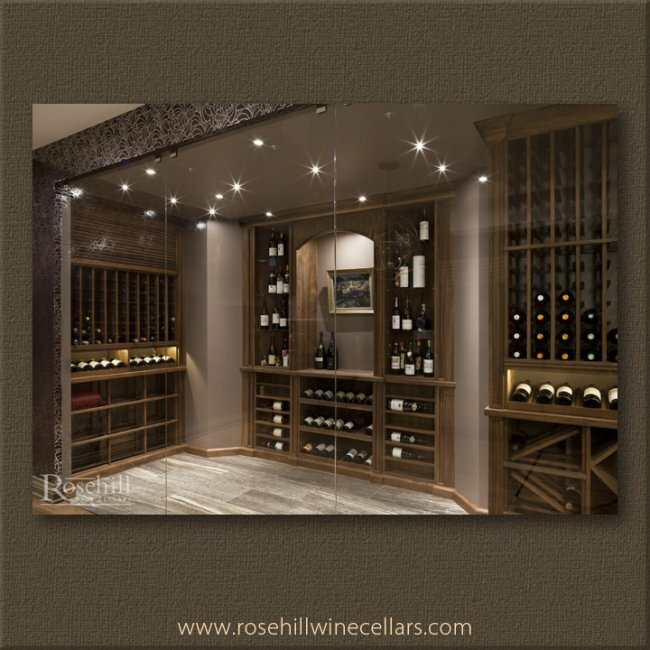 Racking on the walls is a combination of individual single bottle storage and wood case bin storage, there is also plenty of space for display of wine accessories, decanters and larger format bottles. 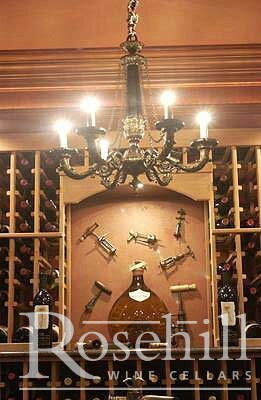 Ornate wall sconces and chandelier work with the theme of this traditional cellar. (SL) The wine cellar cooling system is ducted from room close by. The ductwork within the wine cellar is hidden by large wooden grill to cover both the intake and output ducts. The wooden cabinetry detail is also incorporated into the feature area below with sink, countertop and display storage. The quarter round display complements the sink area with lower closed cabinets and glass storage on the right. (SL) The entrance to this magnificent custom wine cellar is highlighted with a double glass inlay etched doors. 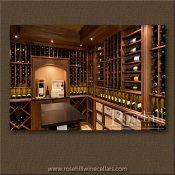 The custom wine cellar accommodates not only wine storage but also displaying a variety of wine accessories with custom shelving. Waterfall racking on the left wall showcases various accessories and the Terra Cotta coloured walls. 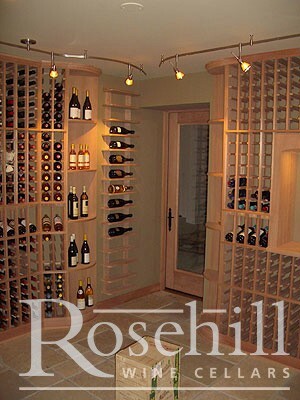 (SL) A variety of racking is showcased in this custom cellar. The wood racks present bottles in a variety of ways: horizontal displays, presentation racks, individual bottle storage, diamond bins and wood case racks allow for varying storage. 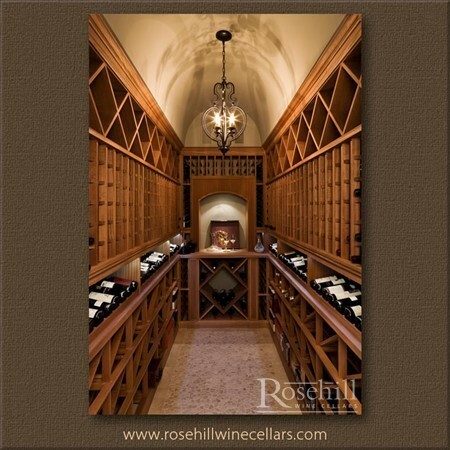 This custom wine cellar features tall crown moulding with detailed columns. The tasting niche features two corner round display units and a nine bottle individual horizontal display. Diamond bins for bulk storage are incorporated in the lower area of the tasting niche. (SL) Incorporated within the tasting niche are three compartments of display shelving; left and right rounded corner displays flank the centre horizontal bottle display showcasing nine bottles. Detailed pillars on either side of the tasting niche help to highlight this decorative focal point. Below the counter top is diamond bin storage. A large amount of wood detail in this custom cellar allows for floor to ceiling and wall to wall continuation of racking and trim work. 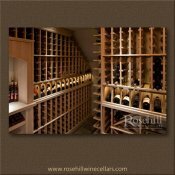 (SL)The narrow custom wine cellar achieves a dramatic look with symmetry of racking and height of the cellar. The eye drawn even further with barrel ceiling. The wood racking is mirrored on either side with individual bottle storage, angle displays and bulk storage below. At the back of the cellar the chandelier light fixture is perfectly hung to take the focus away from the metal grill for the wine cellar cooling unit. The back of the cellar also features a tasting niche with arch reveal and artwork behind. Wood case bins below the tasting niche show the label end of the boxes. (SL) An extra deep counter top is featured in the tasting niche with arch display and cork artwork. 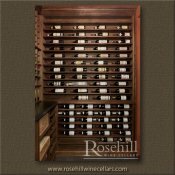 In addition to six compartments of wooden case storage below the tasting niche this custom wine cellar provides plenty of individual bottle storage. 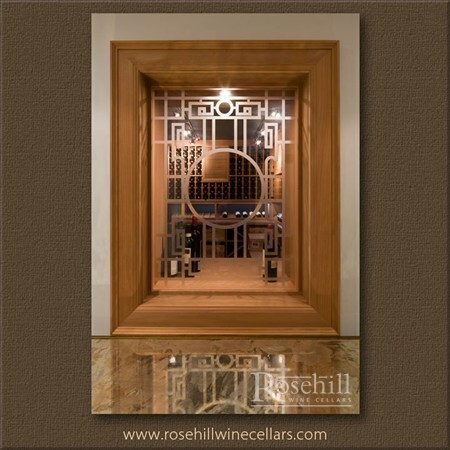 (SL) This wine cellar entrance features a custom door with glass inlay and etched grape leaf design. 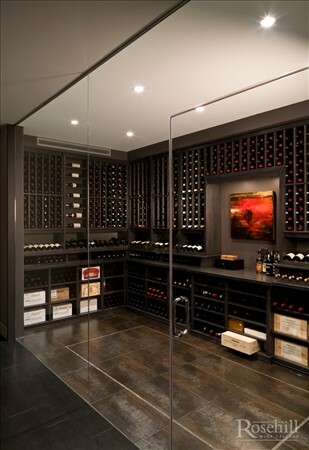 The large glass door provides great sight lines to this stunning custom cellar. 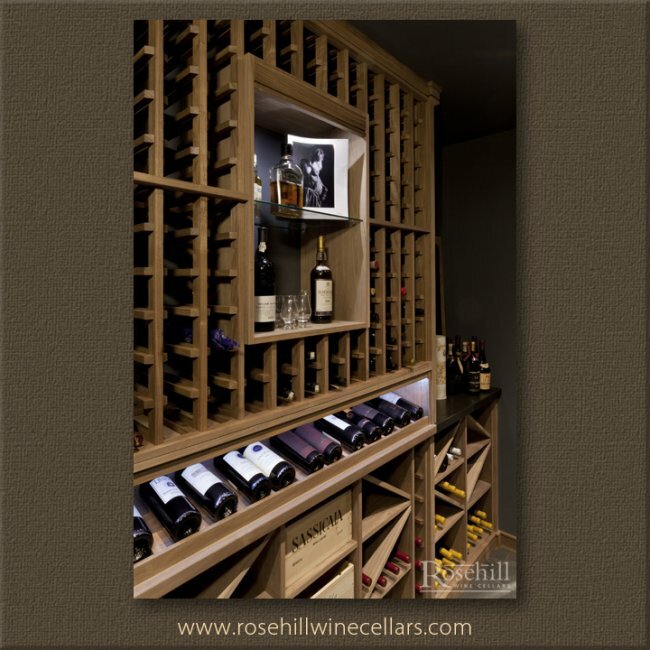 This wine collection is resting within a variety of custom wood racking with both bin, presentation and individual bottle racks used throughout. (SL) Solid Diamond bins in the upper section of this cellar allows for plenty of bulk storage. 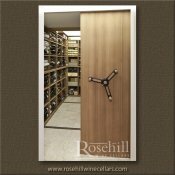 This wine cellar has a variety of storage options which was important to the collector. 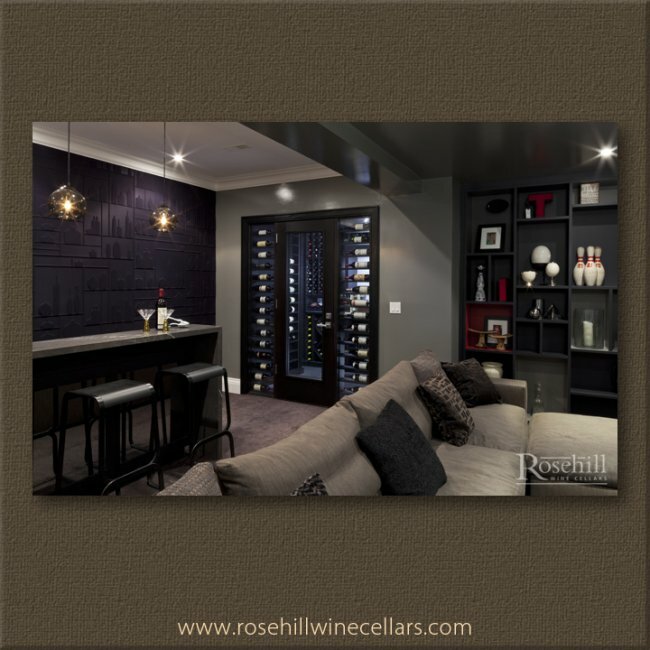 This design satisfied their needs with diamond bin storage in both the upper and lower sections of the cellar and plenty of individual bottle storage. There is also a presentation display rack throughout the cellar for special bottles. 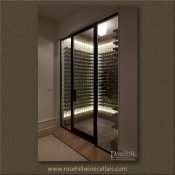 (SL) The end caps of this custom wine cellar feature horizontal display storage which is visible through glass panels on either side of the door. The display is built to hold Individual bottles in rows which have scalloped resting area to cradle the bottle. Note the nicely tucked in single column for half bottles or dessert wine. 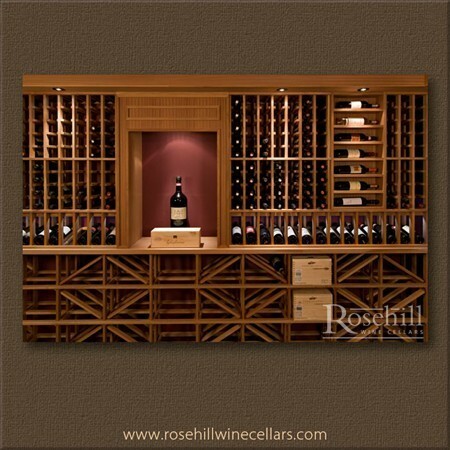 (SL) Displaying your finer vintages is front and center within this custom wine cellar. 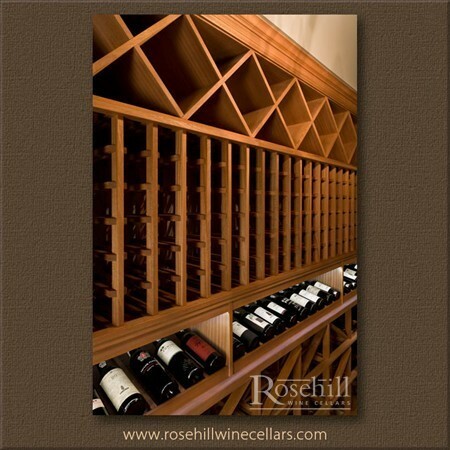 Throughout the cellar and tasting niches, custom display racking is provided. Across from the tasting table is a half round display serving as anchor to a half moon counter top. 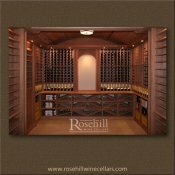 (SL) A double custom tasting niche provides feature areas for custom display racking within this traditional residential wine cellar. 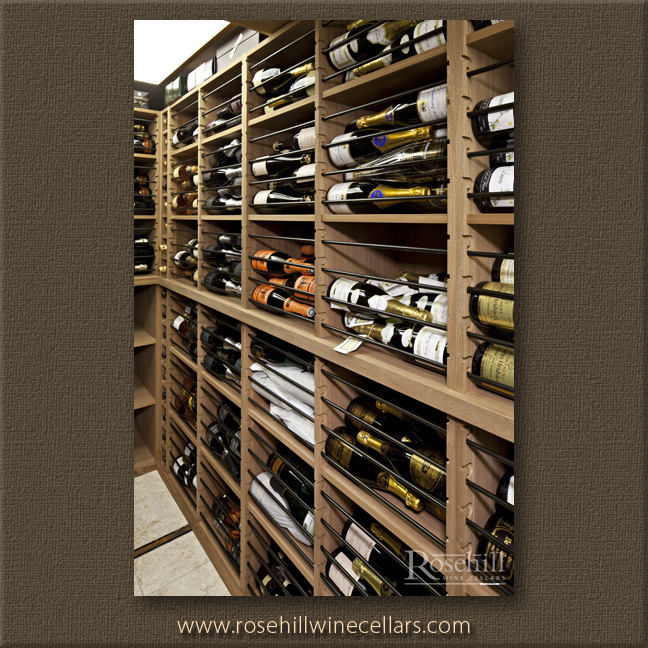 Within each of the tasting niches’ there is horizontal individual bottle display racking. At counter height there is presentation racking to display favourite bottles. Custom wine cellars, with custom racking are as much about displaying the wine treasures collected as they are about storing the entire collection. Beside the tasting table is a half round display serving as anchor to a half moon counter top. Two columns of label forward display racking are set affront of the peninsula to the curved wine racks behind . With multiply tasting niches, a variety of storage designs are incorporated within this custom cellar. Custom wine racking peninsula creates a great opportunity to add storage capacity to a cellar, while also leaving room for unique presentation display racking and a work surface for organizing and tasting. Custom wood wine racking taking advantage of all available cellar wall space to maximize storage and create that old world cellar look and feel. 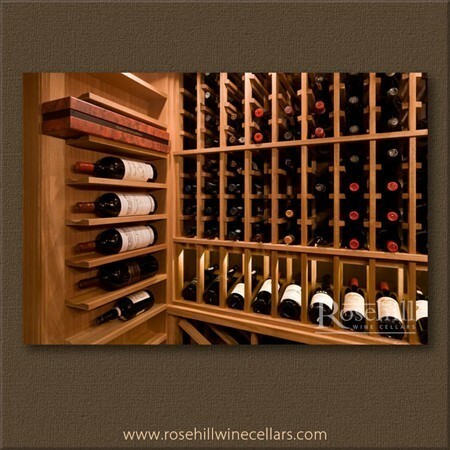 Custom wood wine racks allow for creative ways to display and present a collectors very finest. 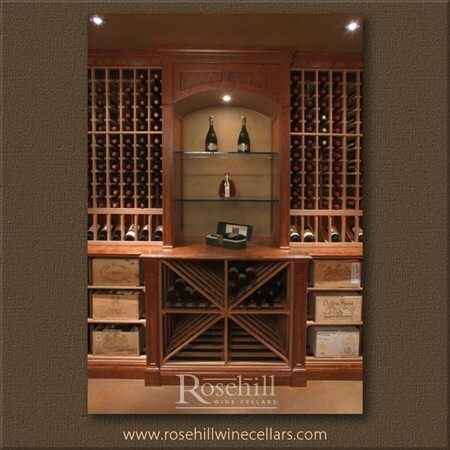 Custom display tasting niche with decorative glass shelving to display prized wine bottles and other collectables. 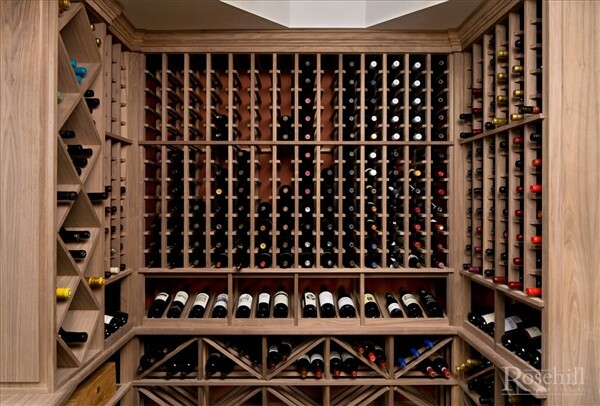 Custom wine racks allows for the opportunity to mix and match wood types and styles of racks, bending the rules to transform old world ideals into a contemporary design. Traditional bordeaux style pine boxes are complemented nicely by adding modern art in the beautiful custom display arch. 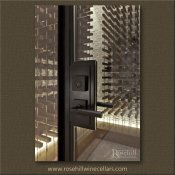 Custom wine cellar viewing windows allows the avid collector the opportunity to enjoy and share their collection even when not in the wine cellar. 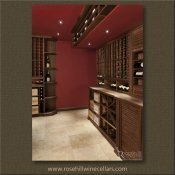 Custom solid double deep bulk wine storage bins creates an excellent platform to fashion a work surface that can double as a presentation area to showcase wines through a decorative wine cellar window. Custom wine racking designed to maximize bottle capacity through the use of bulk storage diamond bins. The evaporator for the split system cooling unit is smartly hidden behind a custom louvered grill. Custom millwork around a bulkhead creates a great opportunity to used LED lighting to showcase the wine within the custom California Redwood racks. 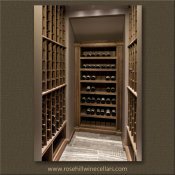 Floor to ceiling, label forward display wine racking and a corner round display finish off the short side of this custom wine cellar. Individual single bottle and a display row finish off the upper storage on the main wall. Below the rail are wood case and diamond bin storage allowing plenty of space for bulk storage in this cellar. 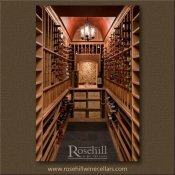 Beautiful custom Redwood wine cellar with presentation and showcase racking sections for trophy wines. Custom racks designed to take full advantage of a unique space. 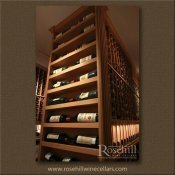 Custom California Redwood racking with custom Wine Cellar Door and entrance surrounded by showcase shelving for special wine bottles. 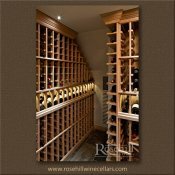 Custom California Redwood racking, balanced and symmetrical to create a cellar that blends both old world charm and contemporary clean lines. 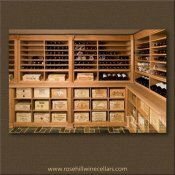 Bringing in old world materials, and dividing a large wine cellar creates an opportunity to both effectively store a large collection of wine while creating a unique space to showcase select special collections. Inside the main cellar are custom racks with predominantly individual bottle storage and diamond bin racks below. 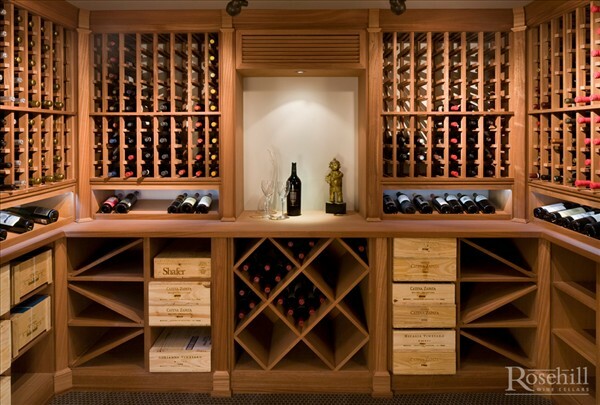 This wine collector has multiple storage options. Custom wine racking designed to both maximize storage - with lots of bulk diamond bins and wood case storage - and also showcase trophy wines in beautiful horizontal displays which present the label art forward. A combination of diamond bin racks, individual single bottle racking, and case bins makes up the storage options within this cellar. 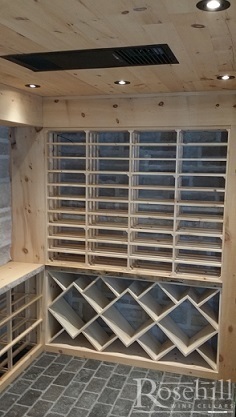 Custom wine racking with custom mill work to hide the cooling unit. Presentation Quarter Round shelving offer nice presentation locations for showcasing special wines or other collectible. The remaining wine storage is made up of individual single bottle storage separated by a presentation display row. 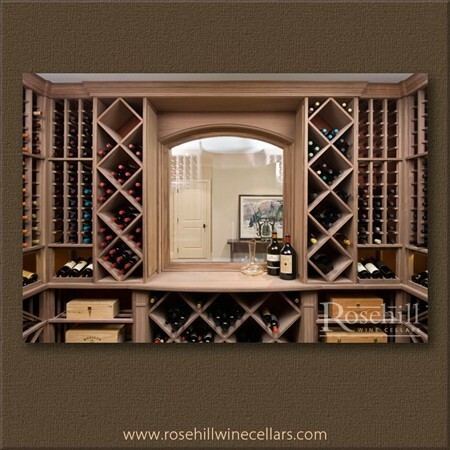 An arched tasting niche further adds a nice design element for this custom wine cellar. 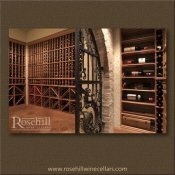 (SL) An arched tasting niche with wood case bins below is a feature within this custom wine cellar. 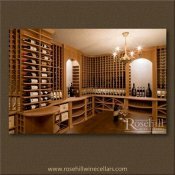 Niche areas and potentially awkward space is utilized with racking and display areas to create a united and custom wine cellar. Additional featured areas have a horizontal bottle label forward displays and floor to ceiling column of racking in the rear of the cellar. The cellar also includes quarter round display shelving in several areas to create rounded outside corners within the wine room. 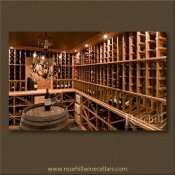 Beautiful and spacious wine cellar featuring California redwood wine racks. 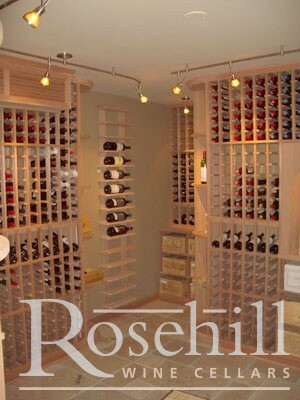 This wine room is cooled with an Onam CW-30W. The cooling unit is cleverly concealed within a cabinet. This wine cellar holds up to 2033 wine bottles. 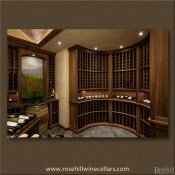 The back wall of this custom wine cellar features an arched tasting niche with individual single bottle storage and diamond bins. Label forward display racking allow special wines within the collection to be displayed. 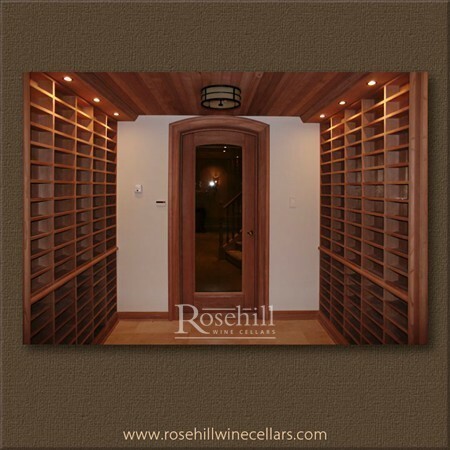 Door view of radiant wine cellar featuring custom redwood wine racks. 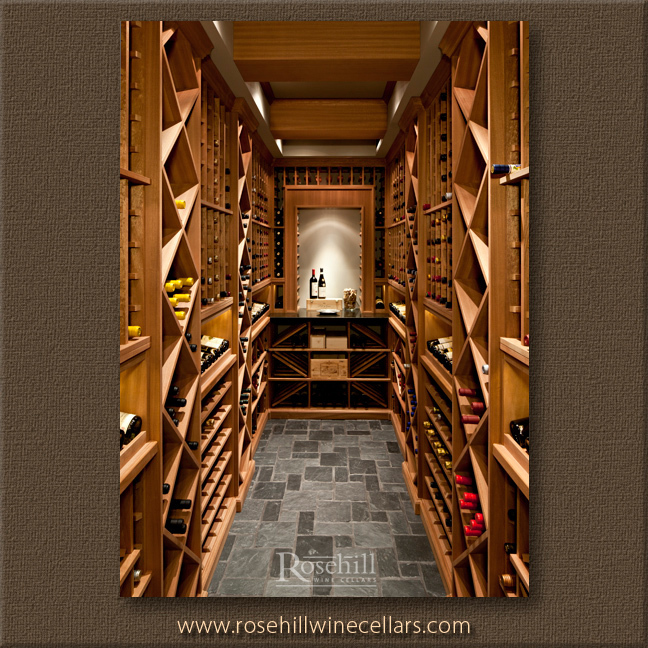 Wine storage floor to ceiling is designed with label forward display racking. 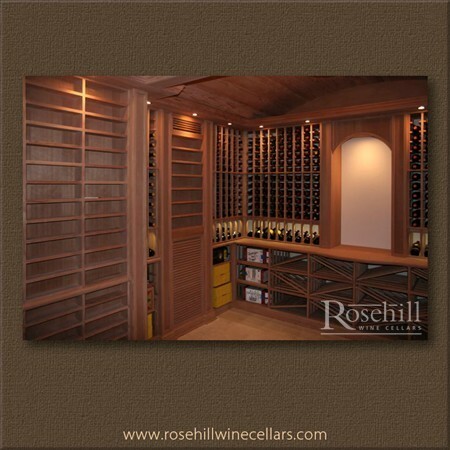 This wine storage cellar is cooled with an Onam CW-30W and holds 2033 wine bottles. 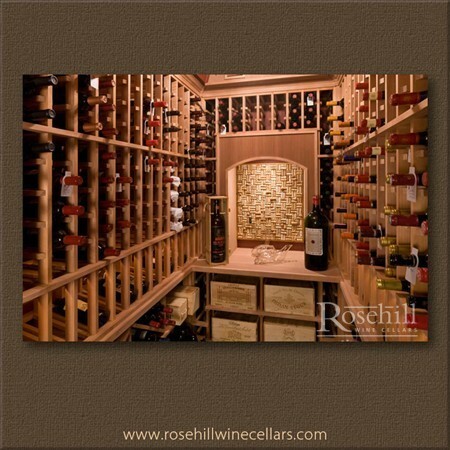 (SL) This Impressive custom wine cellar is made from walnut, and has a beeswax finish. 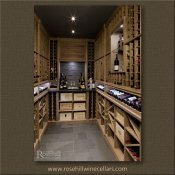 This custom wine cellar provides floor to ceiling wine racks with 750 ml bottle individual bottle storage separated by an angled display. This cellar has a curved wall with racking to suit. A unique wine barrel sink is featured within the tasting niche area. (SL) Showcasing multiple presentation displays, these wine racks feature storage for 750 ml bottles and more. 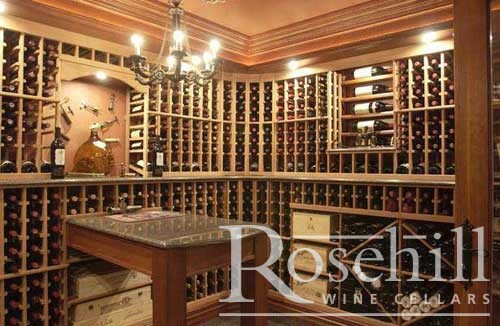 This area of the custom wine cellar is highlighted with a four-bank peninsula, which has an open top shelf angled display. Centered in the room is a wrought iron chandelier. (SL) The cigar & liquor cabinet is finished in walnut with a tinted clear-coat finish. The custom cabinet has lower enclosed storage with an upper glass display for cigars and liquor. A dark marble counter top and sink allow for easy clean up. 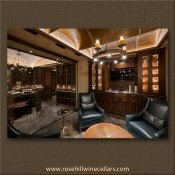 SL) The cigar lounge adjacent to the wine cellar features a walnut barreled ceiling and custom cabinetry. 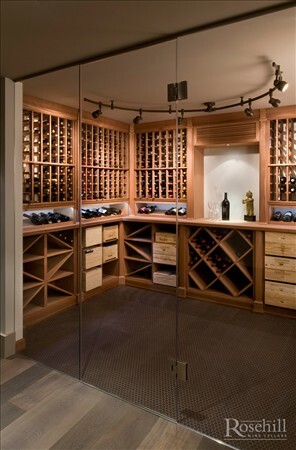 A solid glass walls allows for unobstructed view into the cellar. 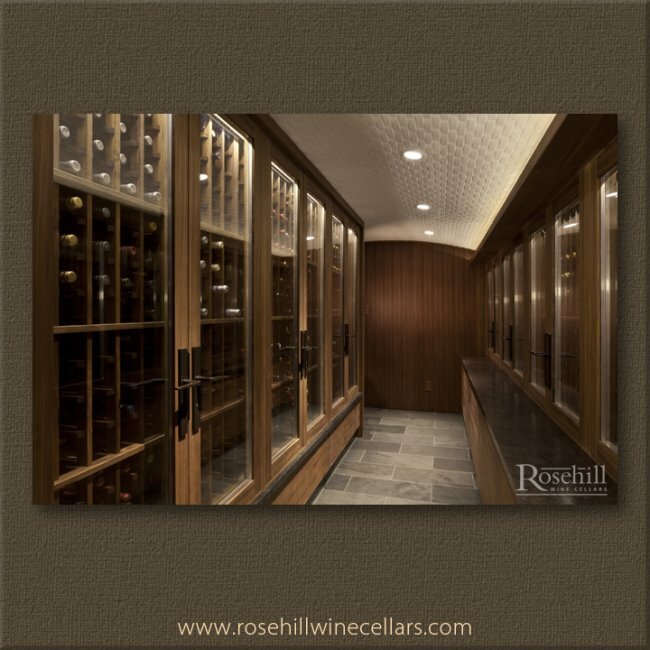 Capacity is about 4500 bottles in the custom walnut wine cellar. (SL) With a sliced brick, vaulted ceiling, and rod iron chandelier this wine cellar is a stand out. The double door entrance with wrought iron accents provides a grand entrance to the extra-large 4 angle peninsula, with open presentation display. The peninsula is flanked with an extra-deep counter for diamond bulk bin storage which separates the upper and lower storage areas. SL) A grand entrance to a grand wine cellar! The arched double door entrance with additional glass panes, features wrought iron inlays. (SL) The focal point of this custom wine cellar is the center island with upper and lower bottle storage. 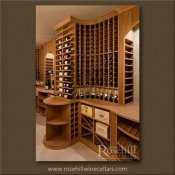 Directly behind the island, the curved wall has wine racks to match the curvature. 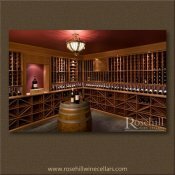 (SL) With capacity of about 4,500 bottles, the traditional wine cellar features walnut wine racks with a beeswax finish. To enhance the old word look is a sliced brick vaulted ceiling with wrought iron chandelier. Highlighting the wine cellar is a stunning feature island with ample storage and presentation displays.